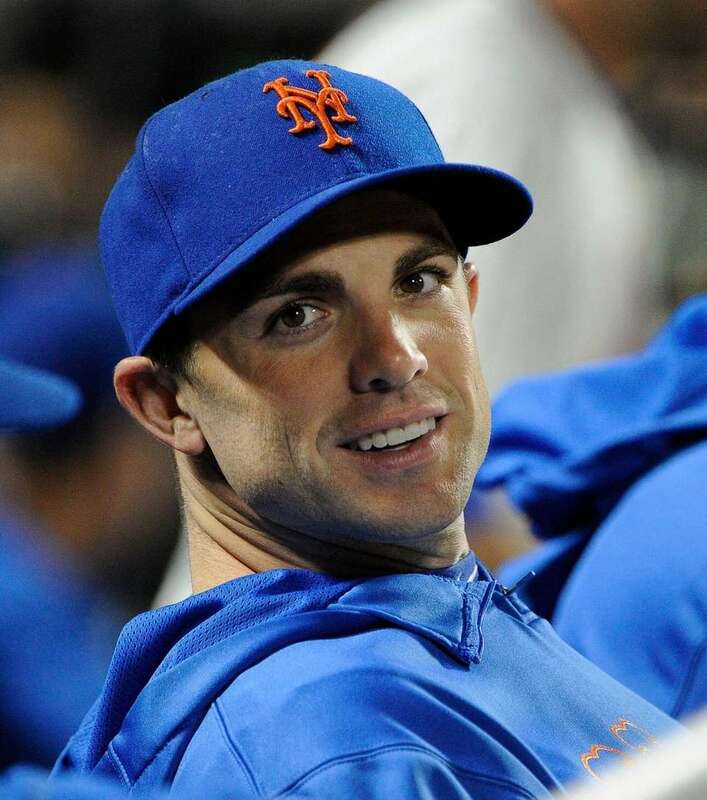 A look back at Mets captain David Wright's career, from his time at Triple-A Norfolk in 2004 to last week's announcement that Saturday's start would be his last. 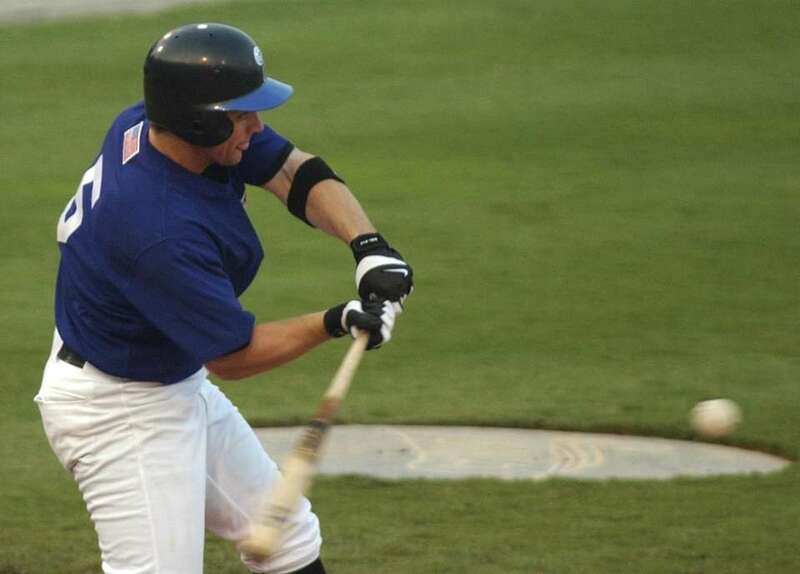 Norfolk Tides player David Wright swings in the first inning against Scranton/Wilkes-Barre at Harbor Park in Norfolk on June 26, 2004. 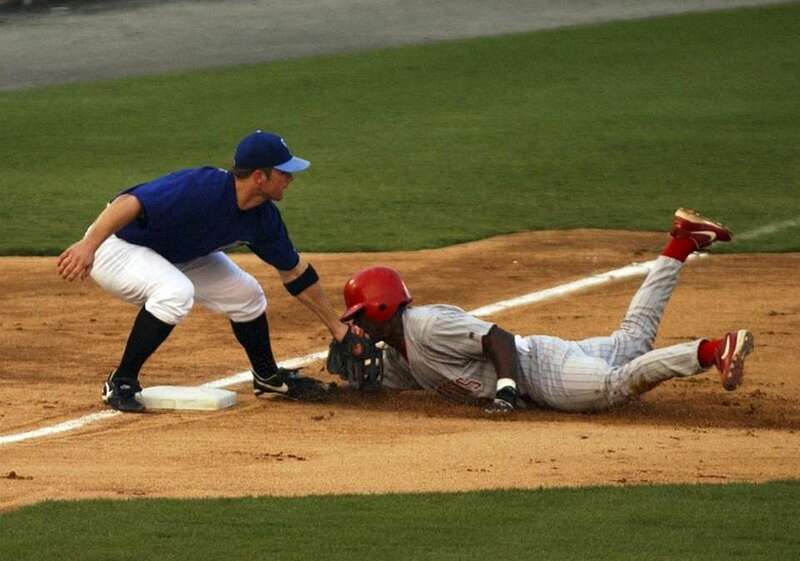 Norfolk Tides third base player David Wright tags out Scranton/Wilkes-Barre Red Barons Pablo Ozuna in the second inning at Harbor Park in Norfolk on June 26, 2004. 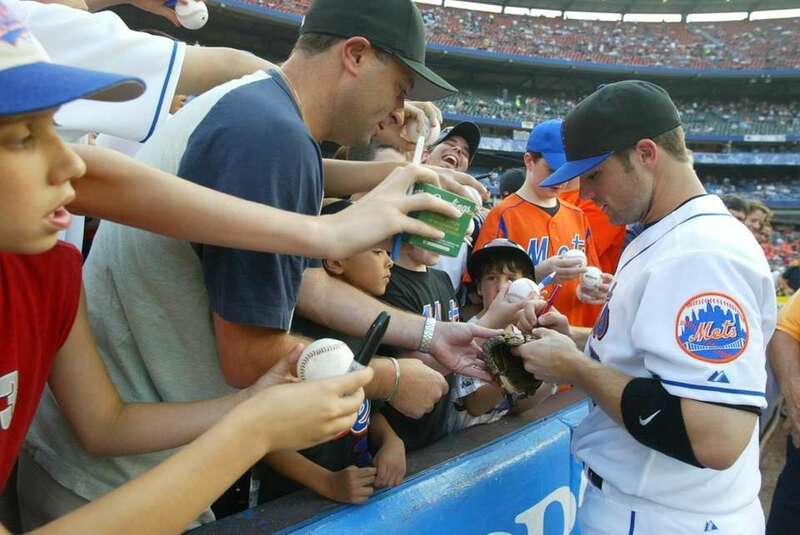 David Wright, the Mets' new third baseman called up from Norfolk, signs autographs for fans before his MLB debut on July 21, 2004, against the Montreal Expos at Shea Stadium. 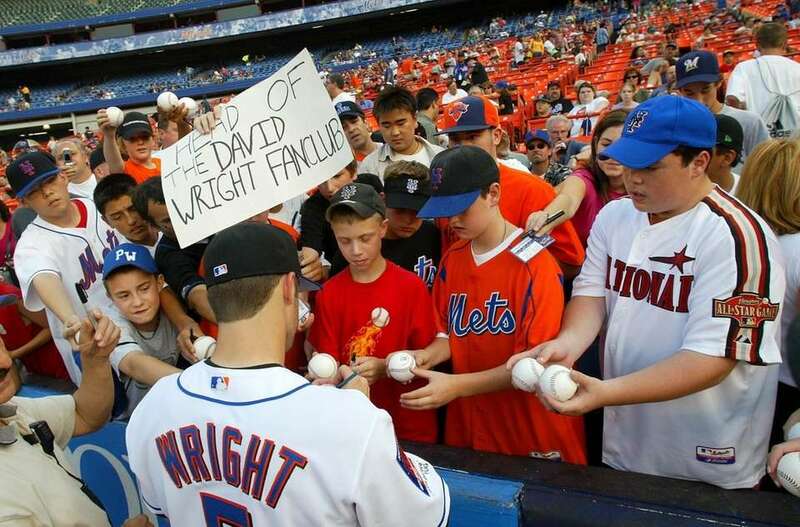 Mets third baseman David Wright signs autographs for fans before his MLB debut against the Montreal Expos at Shea Stadium on July 21, 2004. 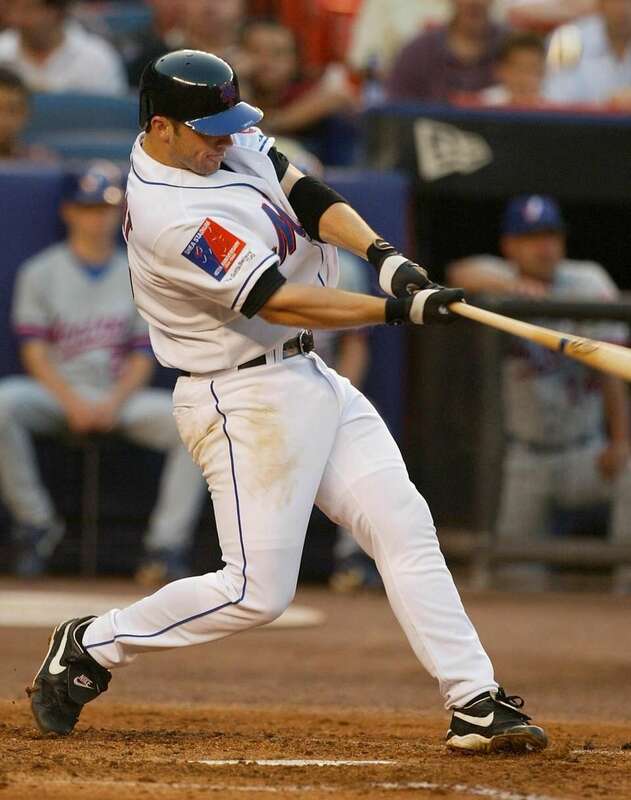 David Wright popped out in foul territory in his first major-league at-bat on July 21, 2004, against the Montreal Expos at Shea Stadium. 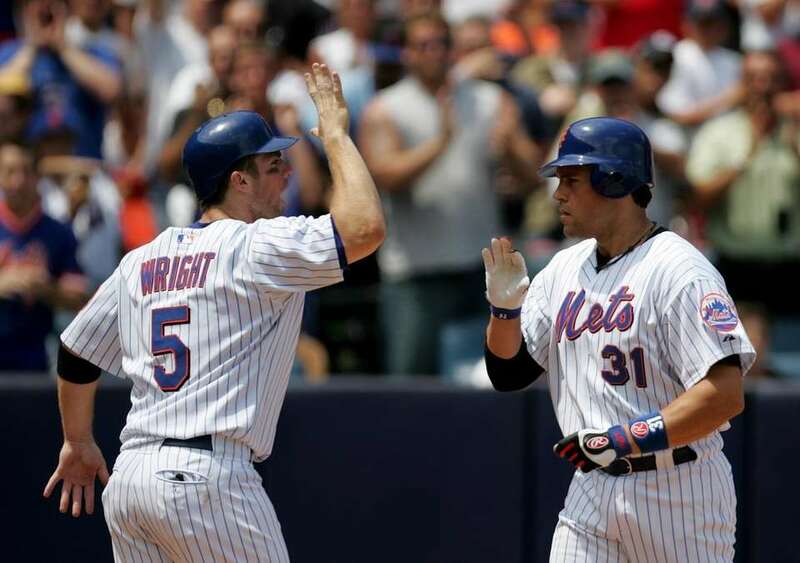 Mets' David Wright greets Mike Piazza at the after Piazza hit a two-run homer off of Dodgers' Brad Penny at Shea Stadium on Sunday, July 24, 2005. 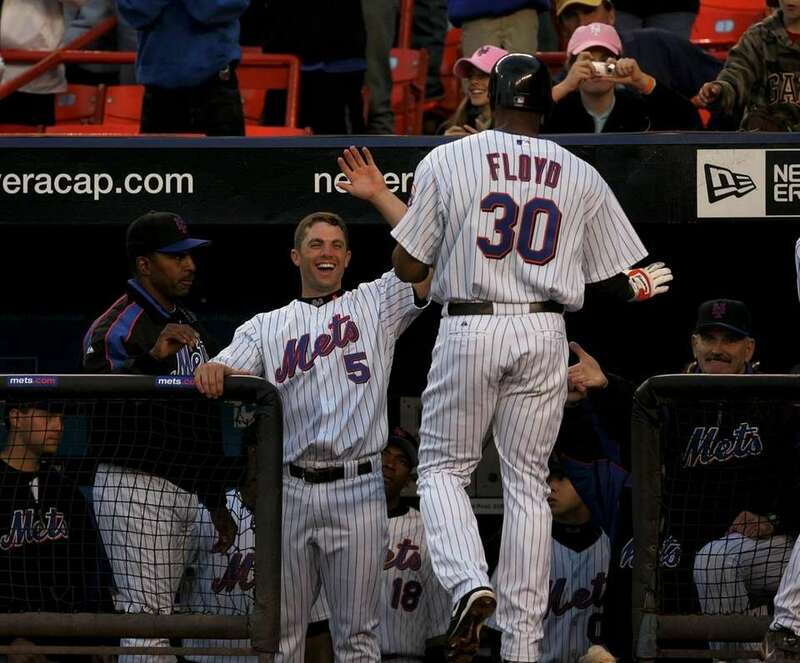 Mets' Cliff Floyd is greeted at the dugout by manager Willie Randolph and David Wright after he hit a solo home run in the first inning of a game against the Reds at Shea Stadium on May 16, 2005. 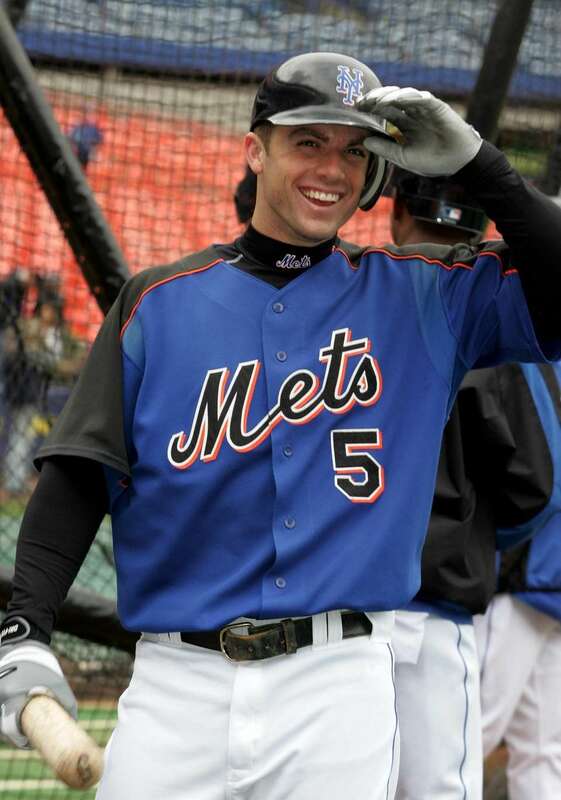 Mets third baseman David Wright looks on during batting practice ahead of his first Subway Series game against the Yankees at Shea Stadium on May 20, 2005. The Mets' David Wright dives over the third base tarp after dropping Jim Thome's fourth-inning popup during a game against the Phillies at Shea Stadium on June 29, 2005. 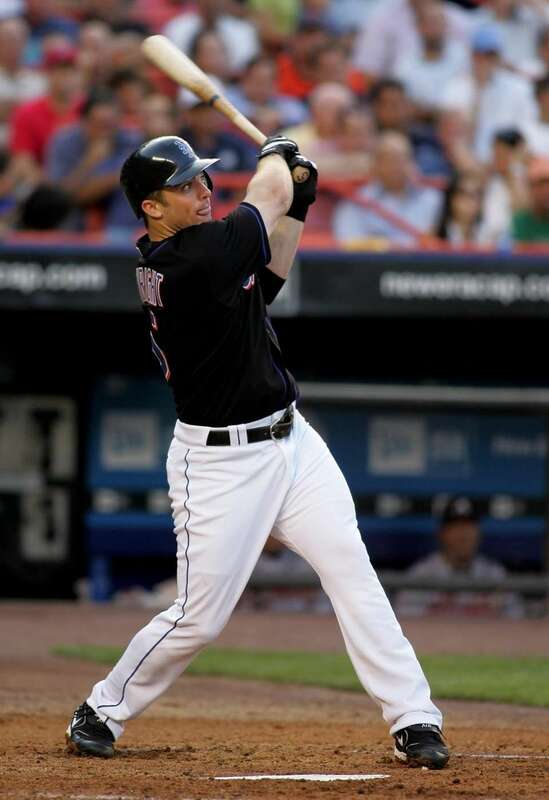 Mets third baseman David Wright hits a solo home run in the second inning of a game against the Braves at Shea Stadium on July 14, 2005. 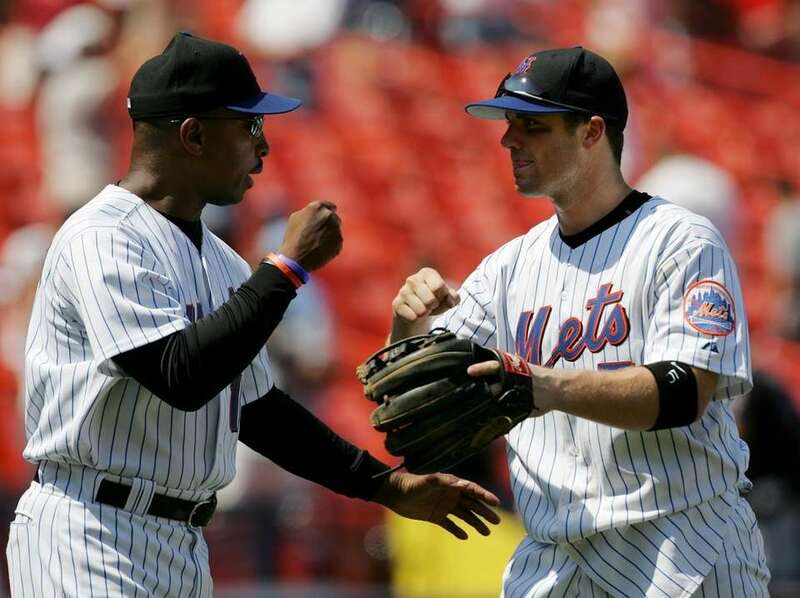 Mets manager Willie Randolph fist-bumps David Wright after the Mets beat the Padres at Shea Stadium on July 21, 2005. 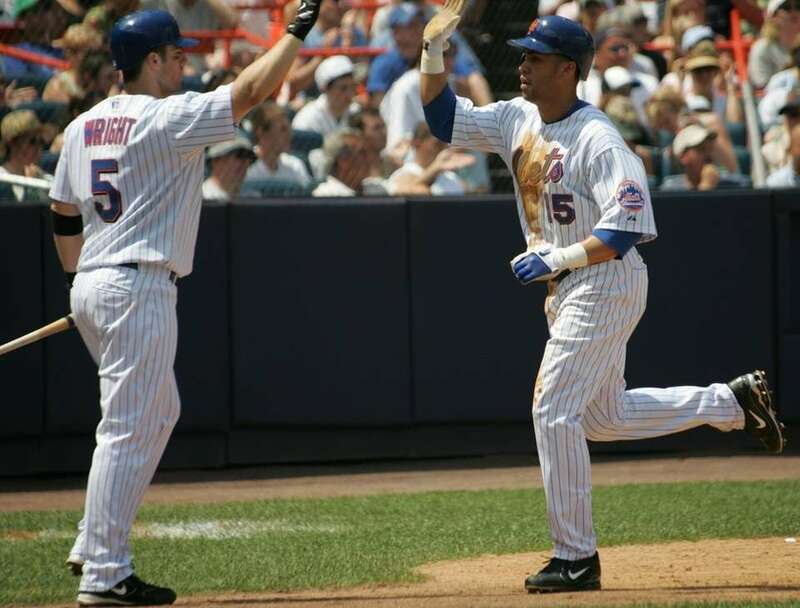 Mets' Carlos Beltran is greeted at the plate by David Wright after scoring on Cliff Floyd's double to put the Mets in the lead against the Los Angeles Dodgers at Shea Stadium on Sunday, July 24, 2005. 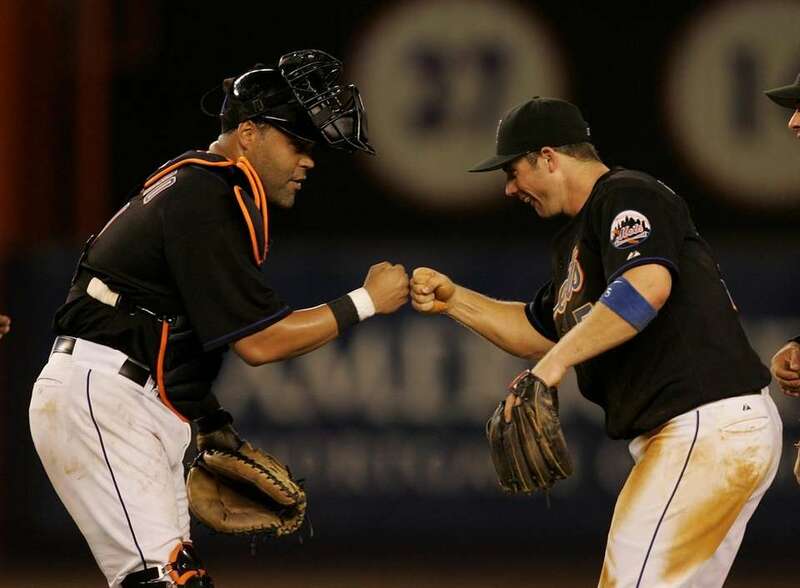 The Mets' David Wright and Ramon Castro celebrate at the end of a game against the Phillies at Shea Stadium on Aug. 30, 2005. 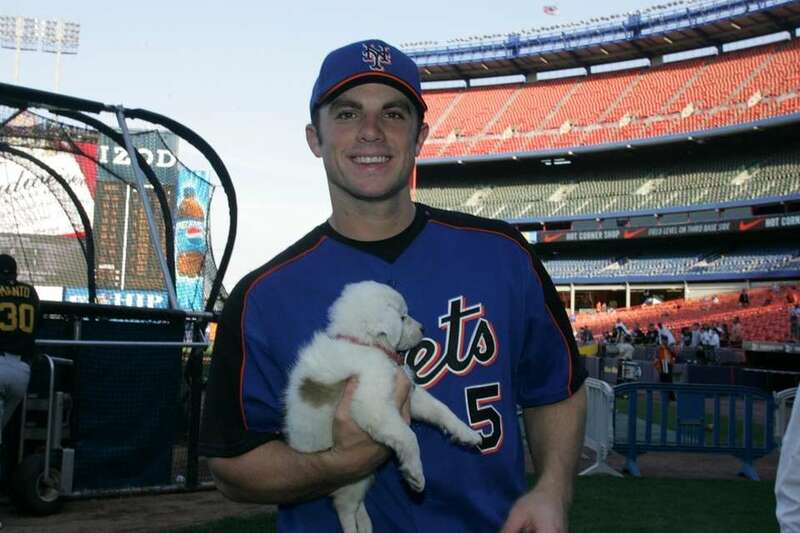 On May 4, 2006, David Wright holds a puppy as the North Shore Animal League in Port Washington visited Mets batting practice today to promote Dogs Days on May 30 and September 23. 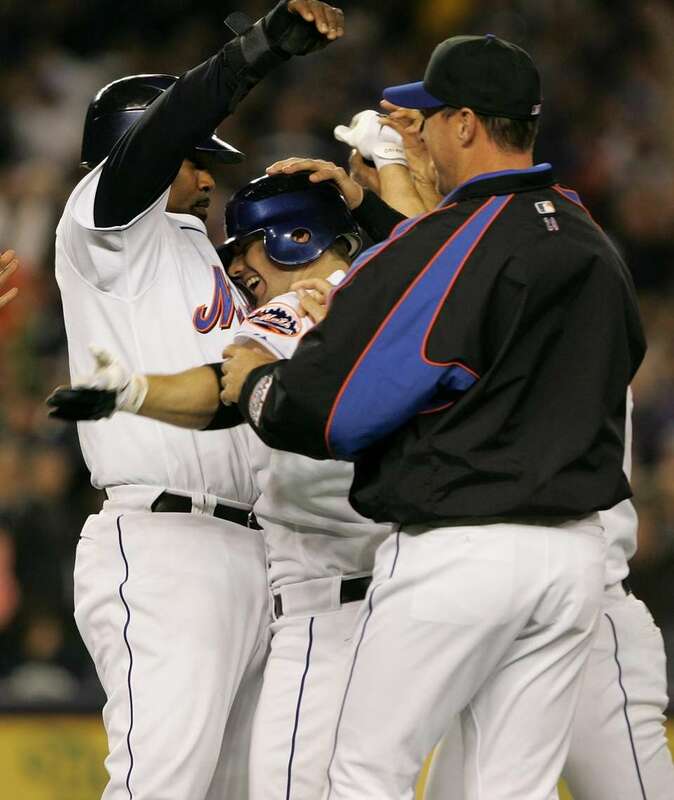 David Wright is hugged by teammates, Cliff Floyd and Steve Trachsel after hitting the winning single off Mariano Rivera in the 9th inning to beat the Yankees at Shea Stadium on May 19, 2006. 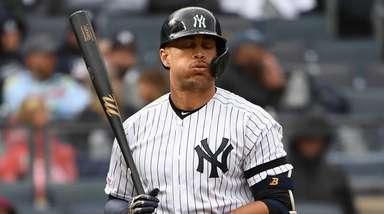 Mets third baseman David Wright catches the Yankees' Bubba Crosby's pop fly for the third out in the eight inning of a Subway Series game at Yankee Stadium on June 30, 2006. 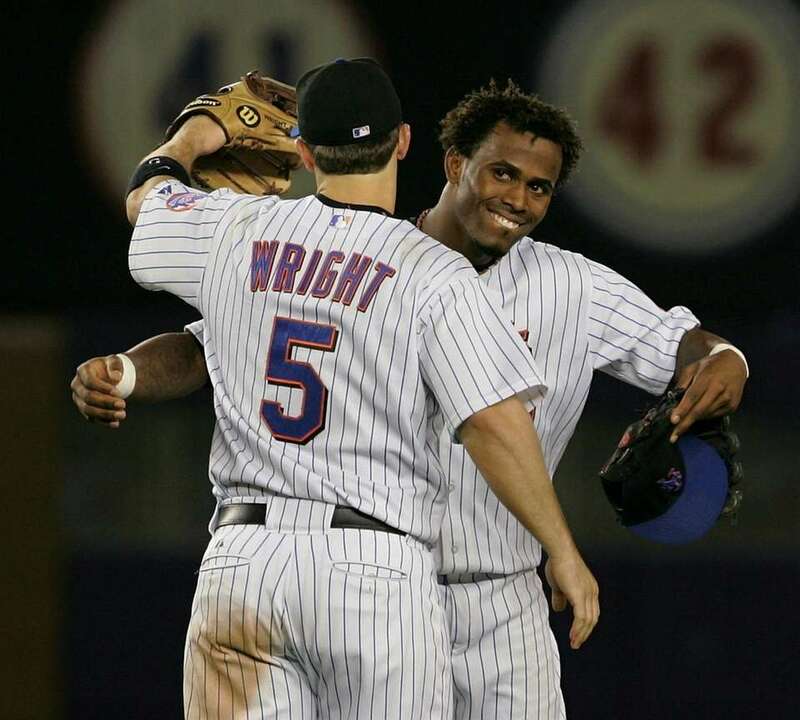 Upon returning to the field in the 9th inning, Jose Reyes gets a congratulatory hug from David Wright after Reyes hit a single in the 8th inning to hit for the cycle against the Red at Shea Stadium on June 21, 2006. 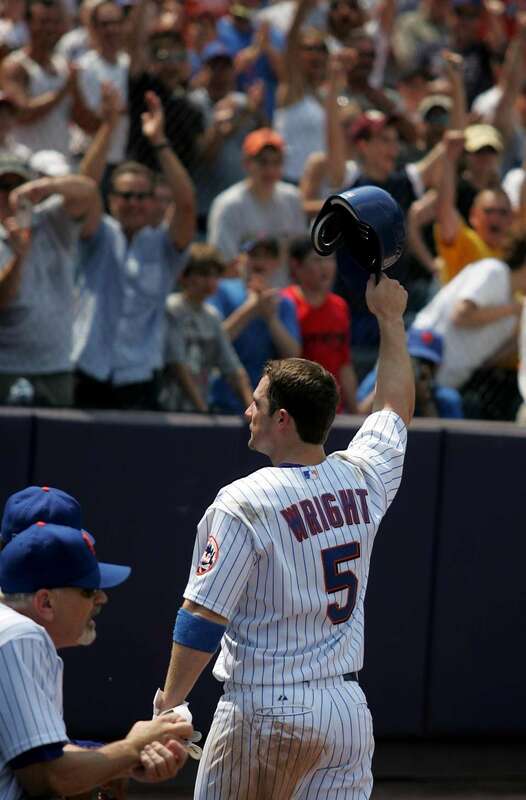 Mets third baseman David Wright comes out for a curtain call after hitting his second two-run home run off of Reds pitcher Eric Milton in the 5th inning of a game at Shea Stadium on June 22, 2006. 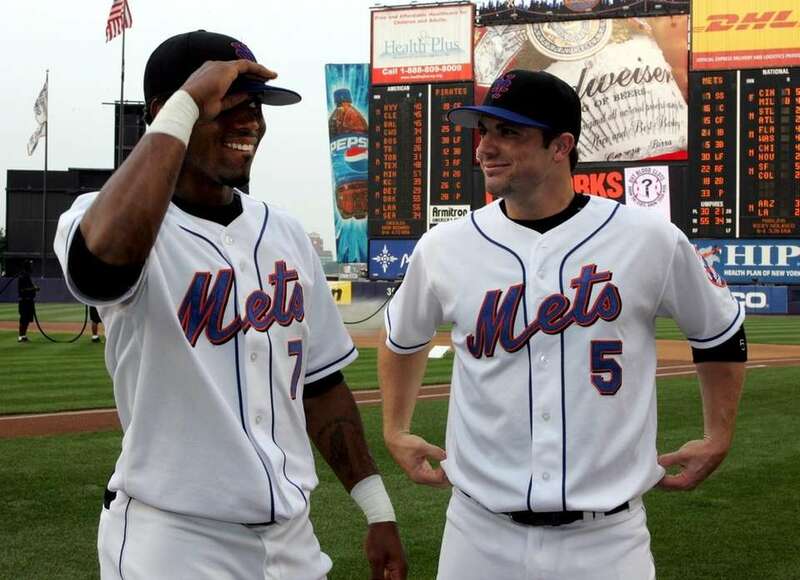 The Mets' Jose Reyes and David Wright are recognized as player of the week and player of the month, respectively, before a game against the Pirates at Shea Stadium on July 3, 2006. 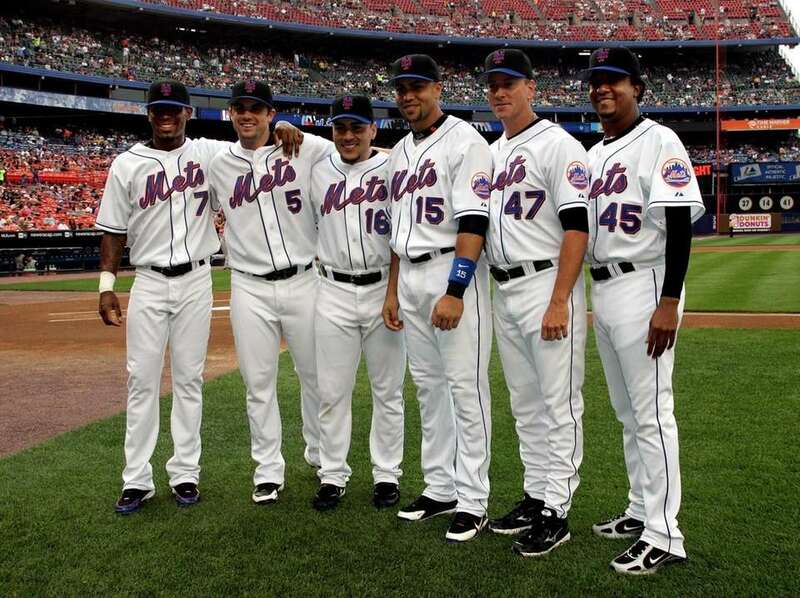 From left, Mets players Jose Reyes, David Wright, Paul LoDuca, Carlos Beltran, Tom Glavine and Pedro Martinez are recognized before a game against the Pirates on July 3, 2006 at Shea Stadium after being selected to the NL team for the 2006 All-Star Game. 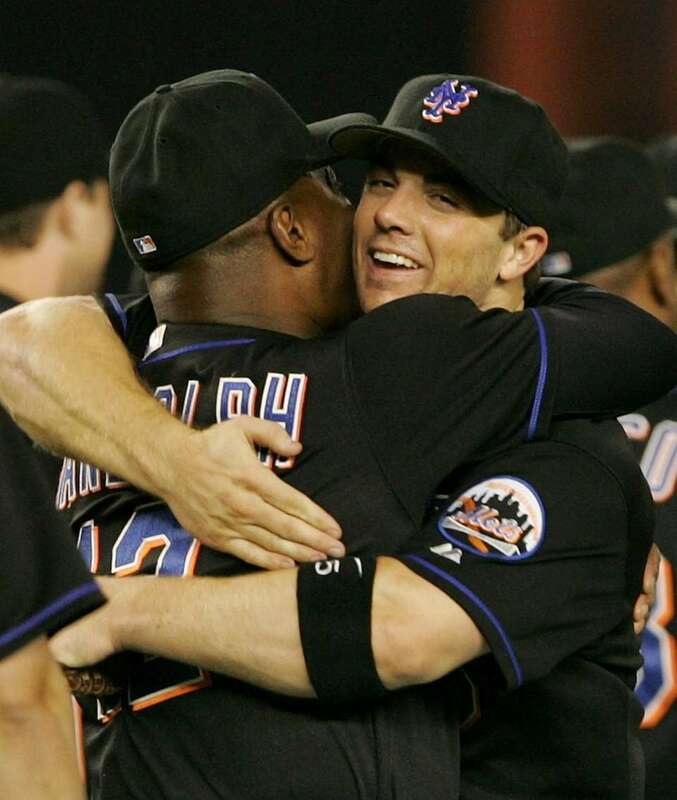 Mets manager Willie Randolph hugs David Wright after the Mets beat the Marlins 4-0 at Shea Stadium to clinch the National League East Division title on Sept. 18, 2006. Mets catcher Paul LoDuca pours champagne down the mouth of David Wright in the locker room after the Mets clinched the National League East Division title with a win over the Florida Marlins at Shea Stadium on Sept. 18, 2006. 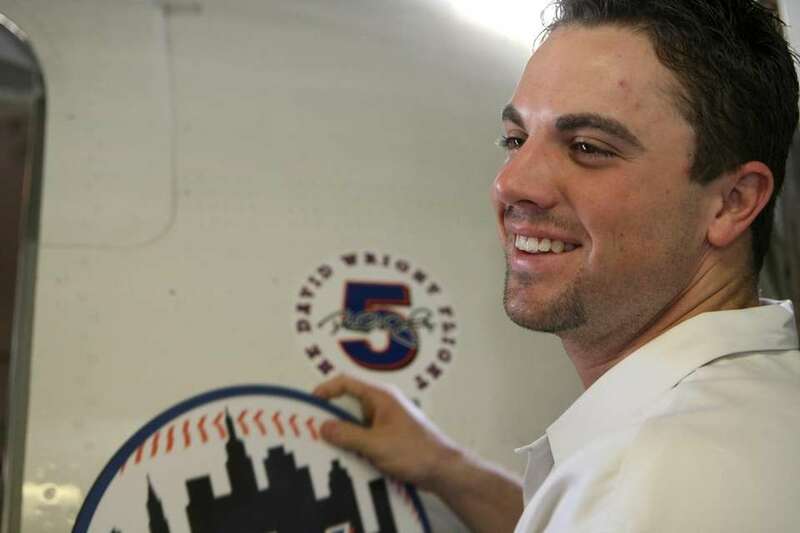 Mets third baseman David Wright unveils the decal with his name on it after Delta Airlines named a flight after him on Oct. 2, 2006. 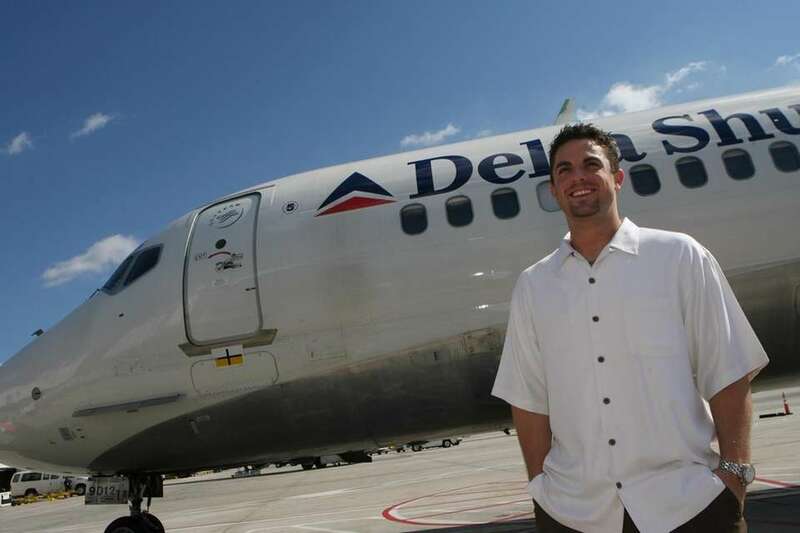 Mets third baseman David Wright stands in front of a Delta jet after unveiling a decal with his name on it. Delta Airlines named a flight after him on Monday, October 2, 2006. 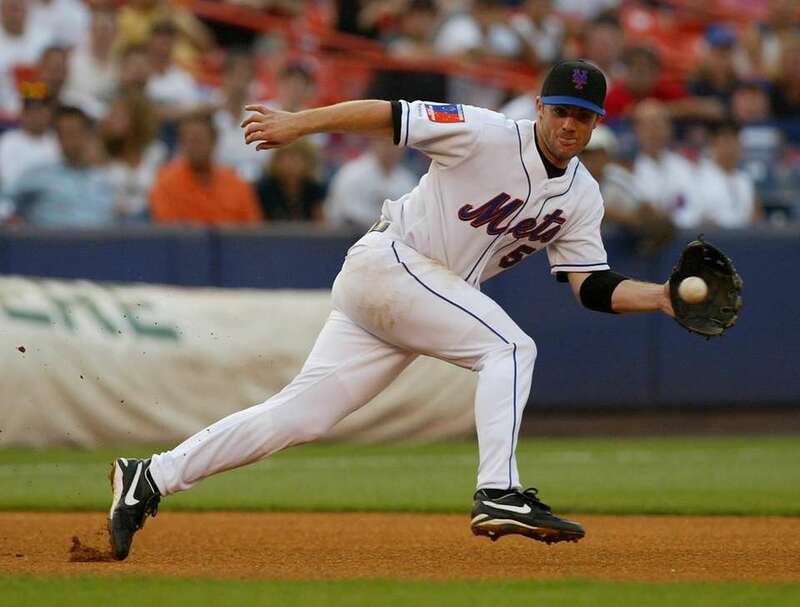 Mets third baseman David Wright slides safely in second on a ground ball hit by Shawn Green in the bottom of the first inning of Game 1 of the NLCS against the Cardinals at Shea Stadium on Oct. 13, 2006. 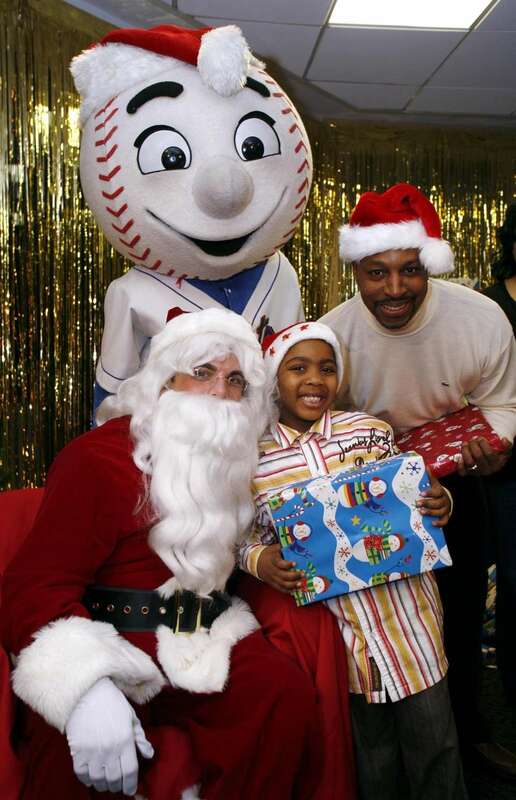 Mets third baseman David Wright, dressed as Santa, gives a gift to Jordan Pruitt, 7, of PS 329 in Brooklyn as Mr. Met and manager Willie Randolph look on during a Christmas party at Shea Stadium on Dec. 13, 2006. 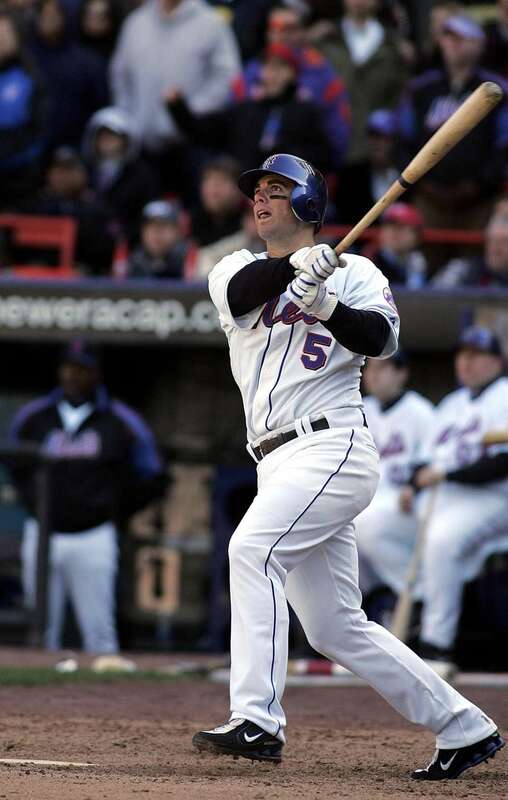 Mets third baseman David Wright hits a two-run double during a game against the Phillies at Shea Stadium on April 9, 2007. 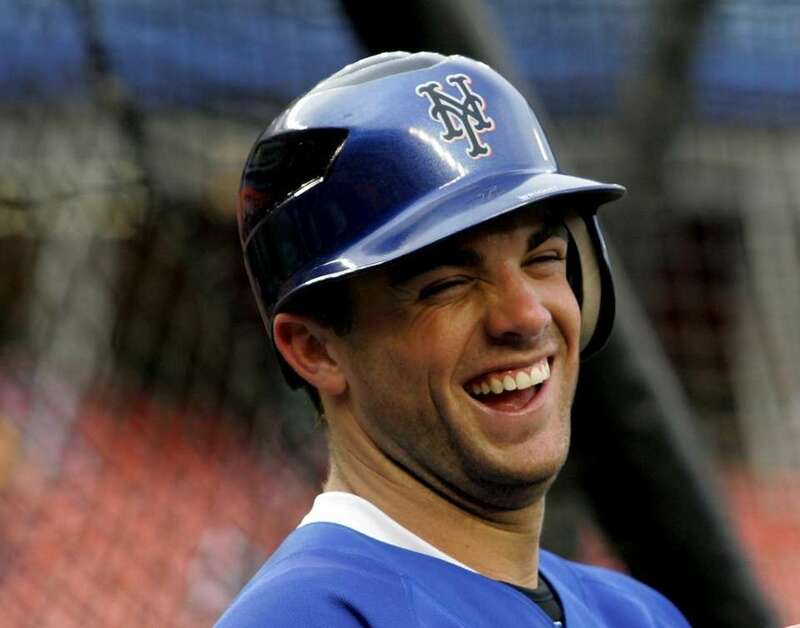 Mets third baseman David Wright laughs during batting practice before a game against the Phillies at Shea Stadium on April 11, 2007. 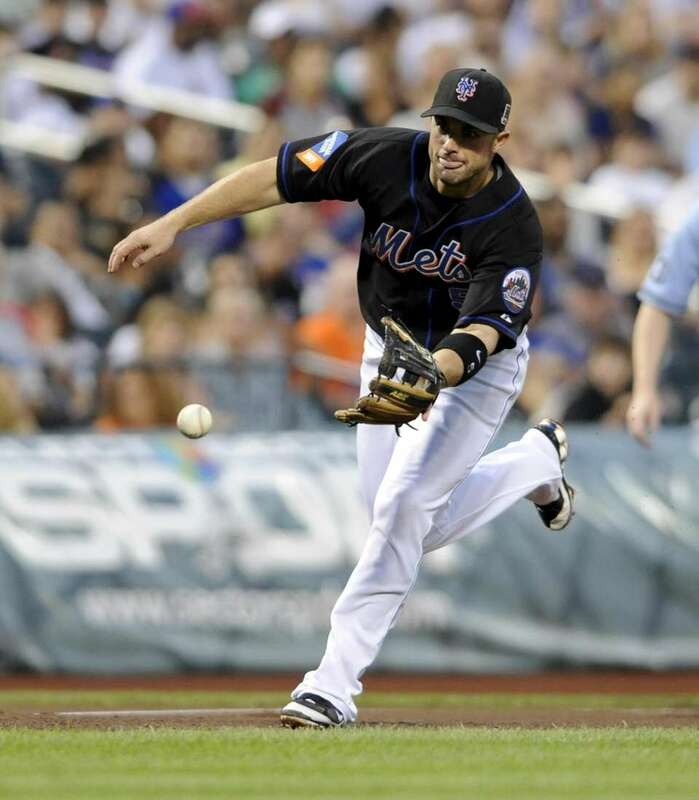 Mets third baseman David Wright pops up to centerfield during the first inning of the Mets' last home opener at Shea Stadium against the Phillies on April 8, 2008. 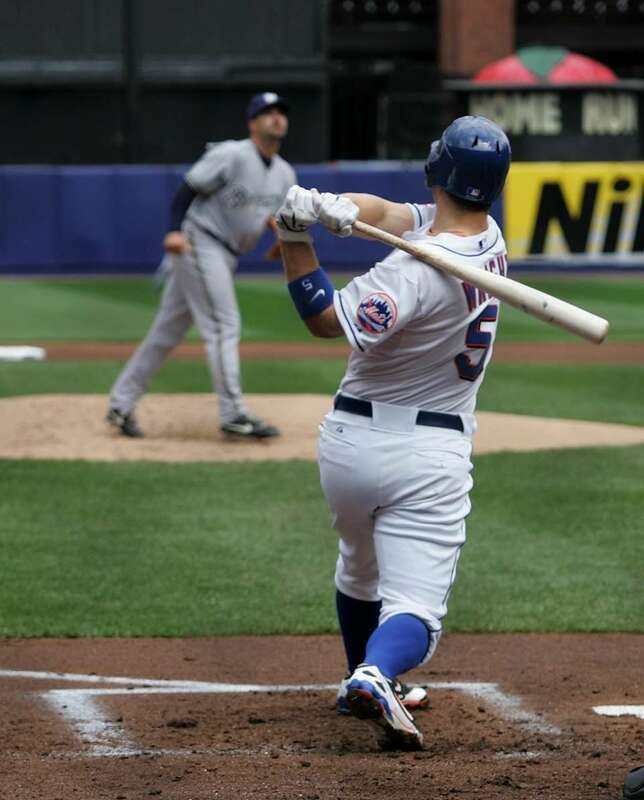 Mets third baseman David Wright hits his 100th career home run off of Brewers pitcher Jeff Suppan in the first inning of a game at Shea Stadium on April 13, 2008. 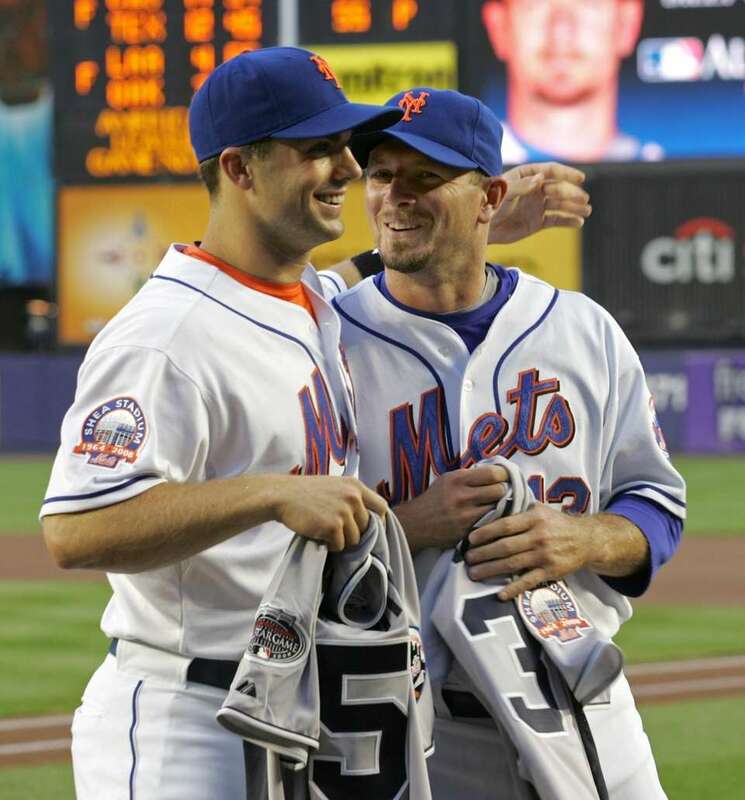 Mets third baseman David Wright and Billy Wagner receive their All-Star Game jerseys before a game against the Rockies at Shea Stadium on July 13, 2008. 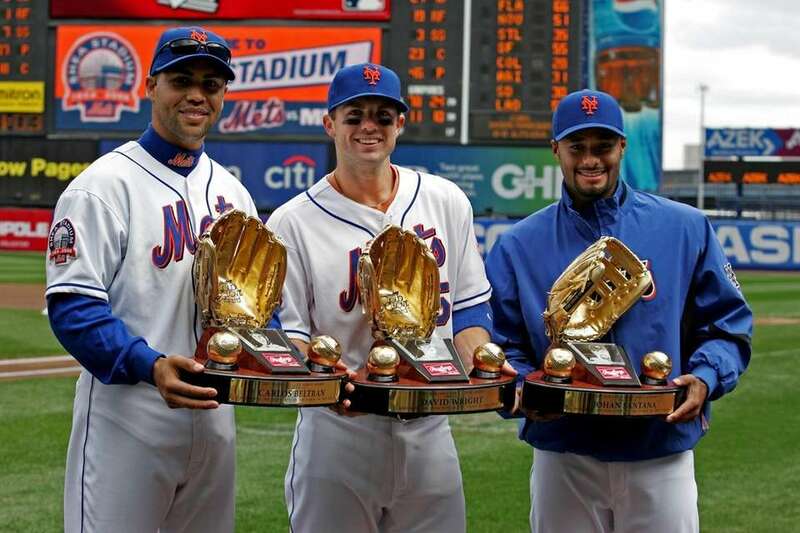 Mets' Carlos Beltran, David Wright and Johan Santana were presented with Gold Glove awards before the game at Shea Stadium on April 13, 2008. 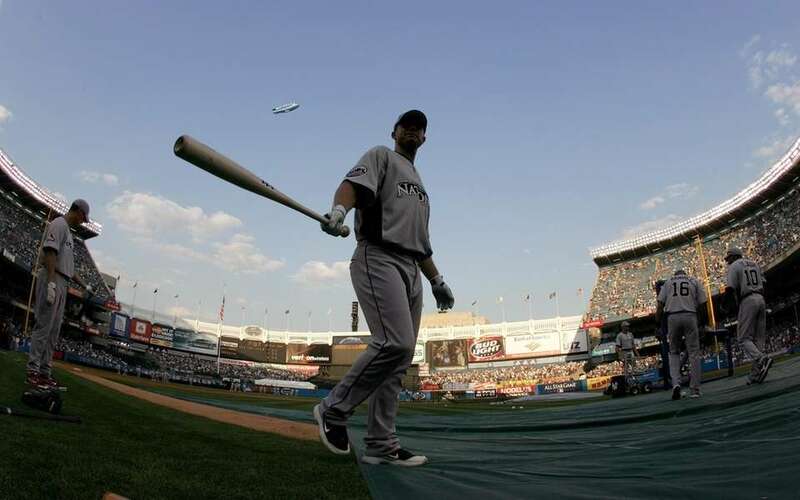 Mets third baseman David Wright looks on during batting practice for the MLB All-Star Game at Yankee Stadium on July 15, 2008. 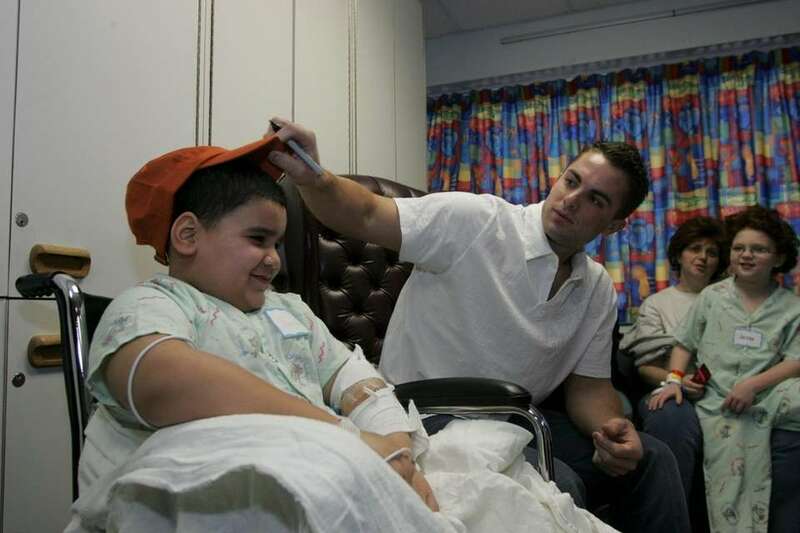 Jeremiah Gonzalez, 6, gets a signed cap from New York Mets third baseman David Wright as he visits children at Schneider Children's Hospital in Lake Success on Jan. 22, 2009. 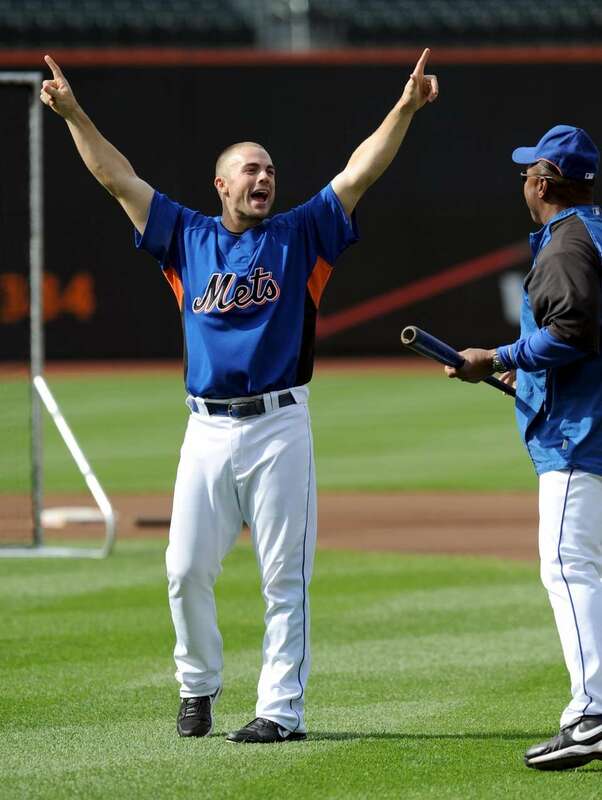 Mets third baseman David Wright celebrates as third base coach Razor Shines, right, watches after the two challenged each other to a baseball version of a three-point shooting contest during batting practice at Citi Field on May 11, 2009. 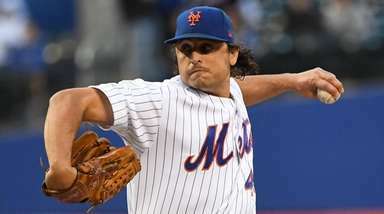 Mets third baseman David Wright takes the throw from rightfielder Ryan Church to get the Braves' Yunel Escobar out at third base in the ninth inning of a game at Citi Field on May 13, 2009. 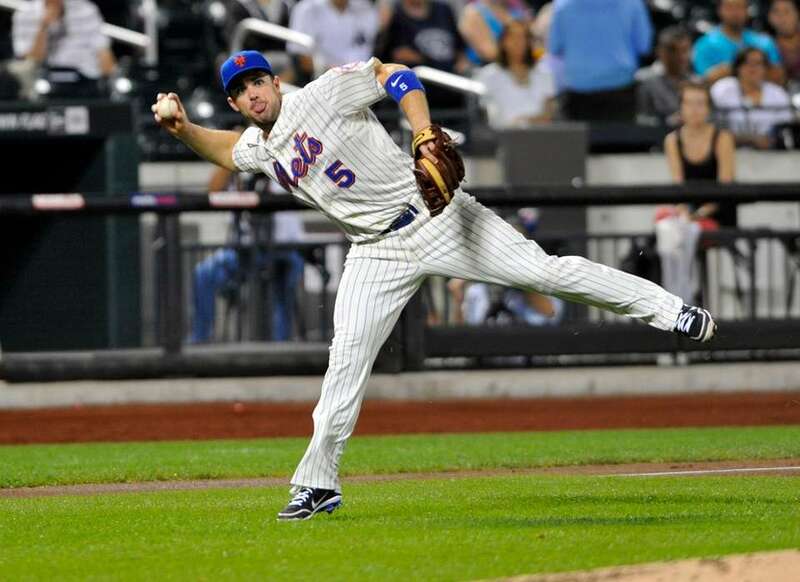 Mets third baseman David Wright charges and fields a ground ball off the bat of the Rockies' Ryan Spilborghs during the fourth inning of a game at Citi Field on July 30, 2009. 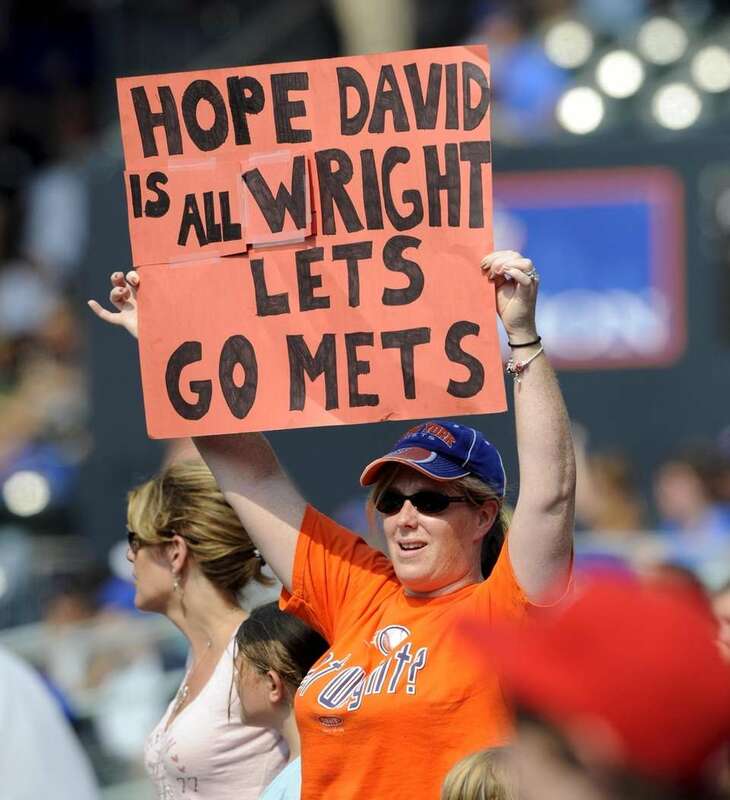 Kelly Amoruoso of Franklin Square holds up a get well sign for Mets third baseman David Wright during a game against the Giants on Aug. 16, 2009 at Citi Field. 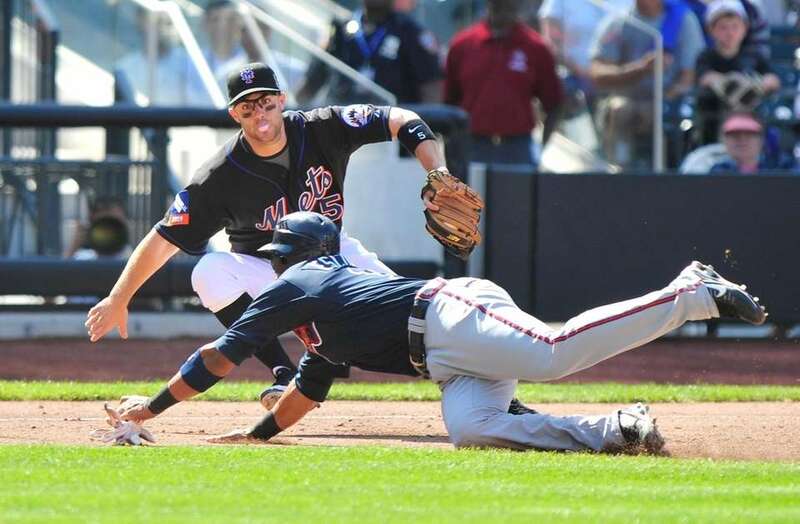 Mets third baseman David Wright dives to field a ground ball hit by the Marlins' Jorge Cantu during the sixth inning of a game at Citi Field on Sept. 9, 2009. 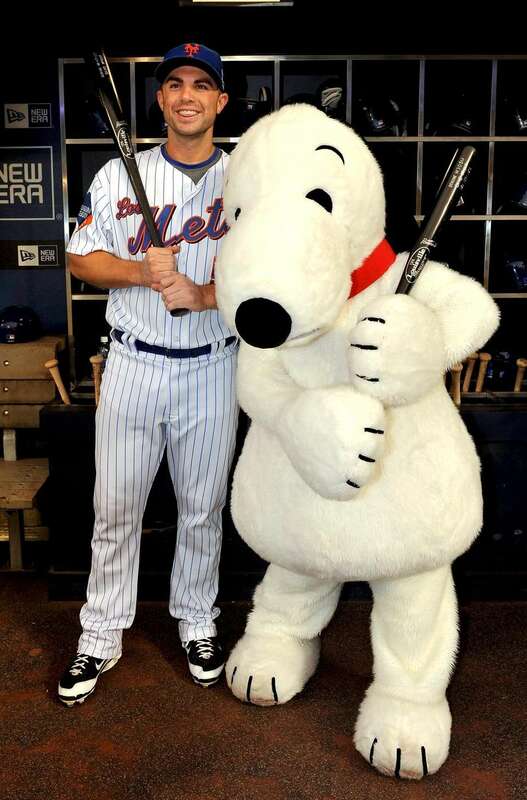 Snoopy visits with Mets third baseman David Wright in the dugout before a game against the Braves at Citi Field on Sept. 22, 2009. 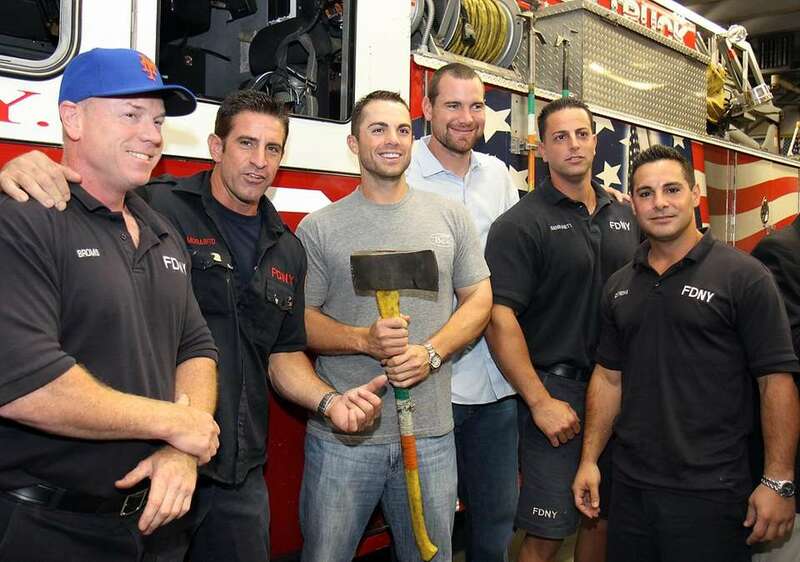 The Mets' David Wright and Mike Pelfrey pose with firefighters from Ladder 10, Engine 10, the firehouse located next to Ground Zero, on Sept. 10, 2010. 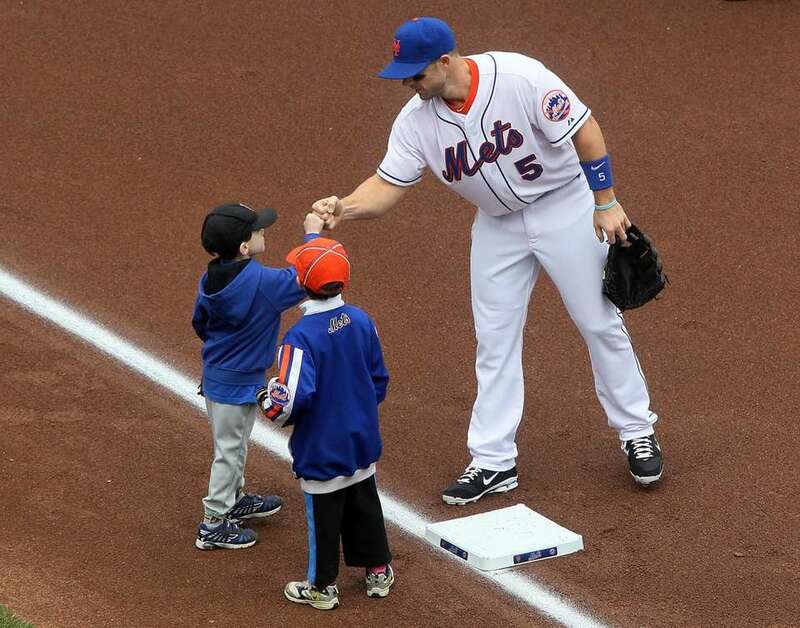 The Mets' David Wright greets children at third base before a game against the Nationals at Citi Field on April 10, 2011. 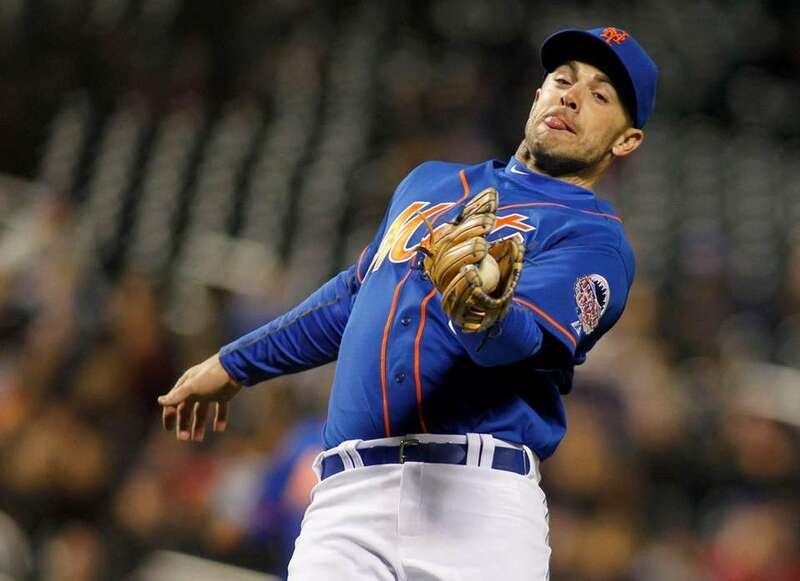 Mets third baseman David Wright fields a slow roller to third base and throws out Wilson Ramos in the third inning of a game against the Nationals at Citi Field on Sept. 12, 2011. 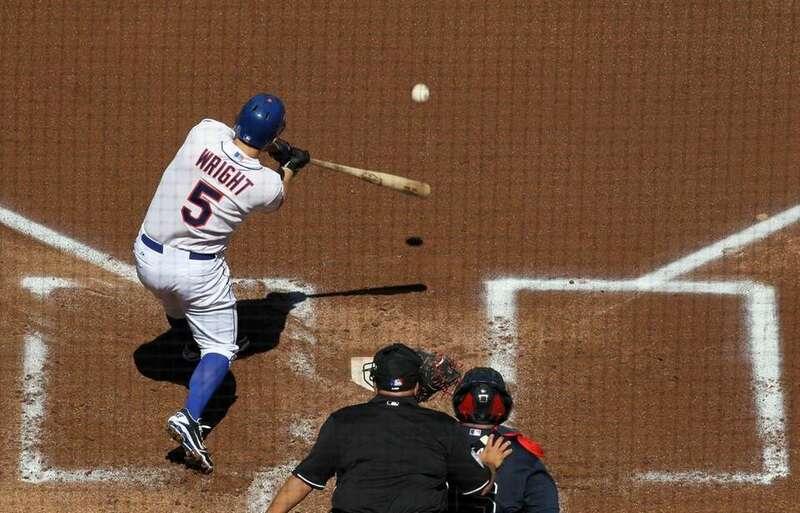 Mets third baseman David Wright connects on a first-inning home run against the Braves at Citi Field on April 7, 2012. 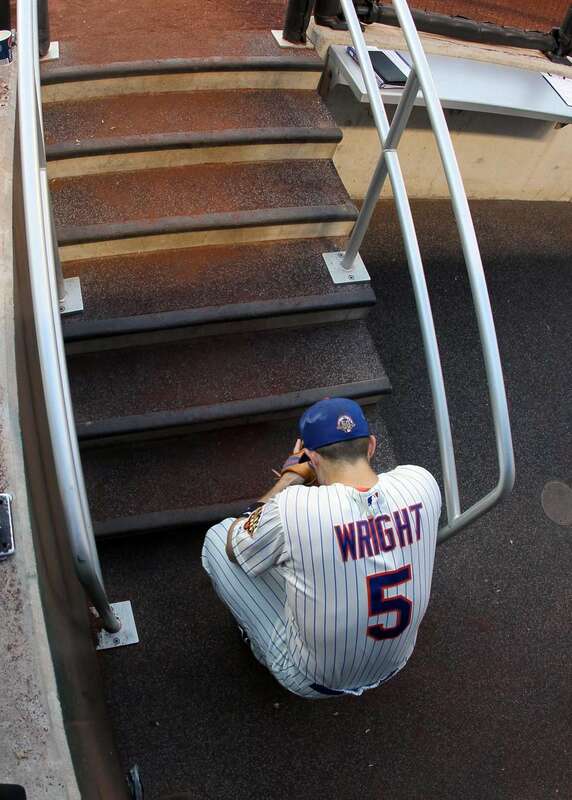 David Wright of the New York Mets waits to take the field to play against the Cincinnati Reds at Citi Field on June 16, 2012. 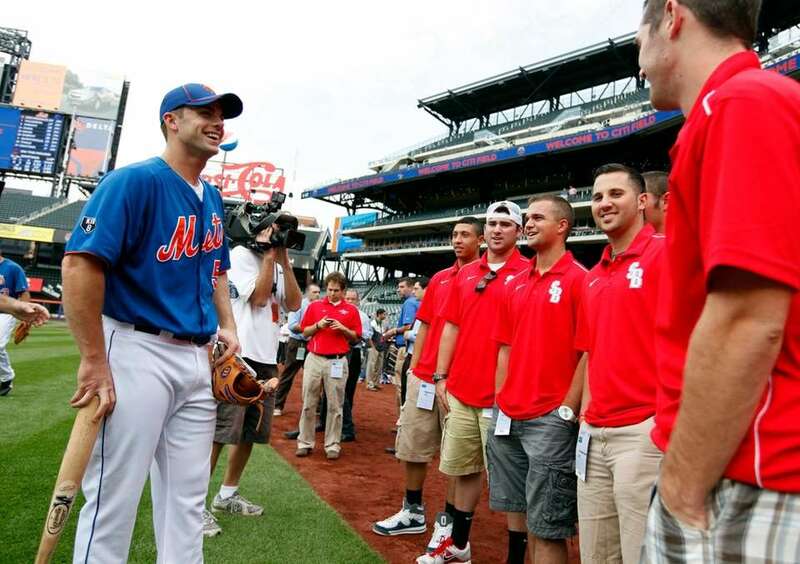 Mets third baseman David Wright visits with members of the Stony Brook baseball team during batting practice before a game against the Orioles on June 19, 2012 at Citi Field. 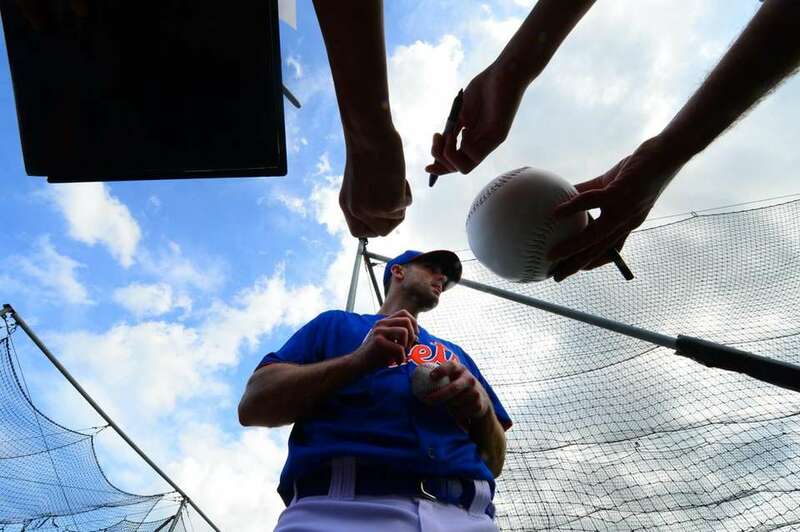 Mets third baseman David Wright signs autographs during a spring training workout on Feb. 21, 2013 in Port St. Lucie, Florida. 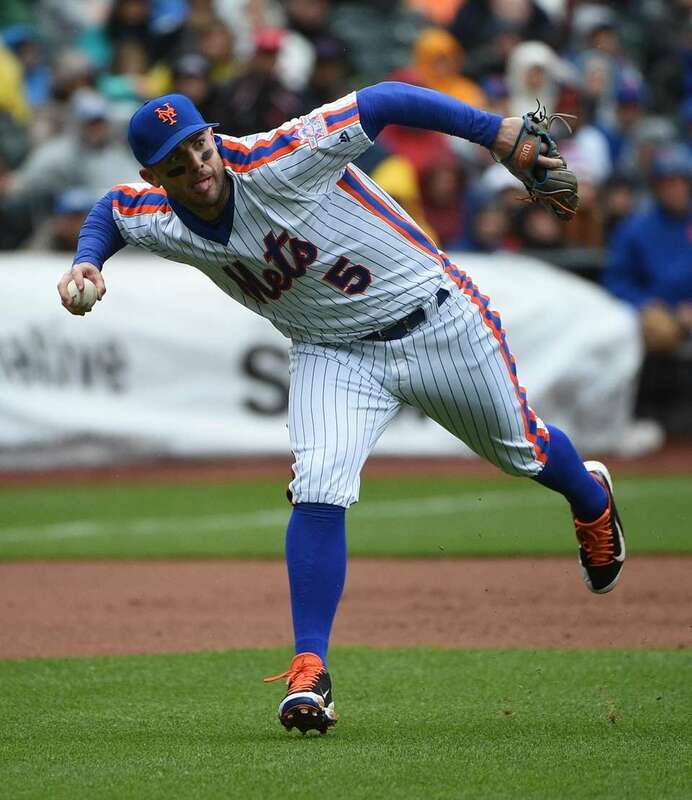 Mets third baseman David Wright tracks down a popup in the second inning during a game against the Marlins at Citi Field on April 5, 2013. 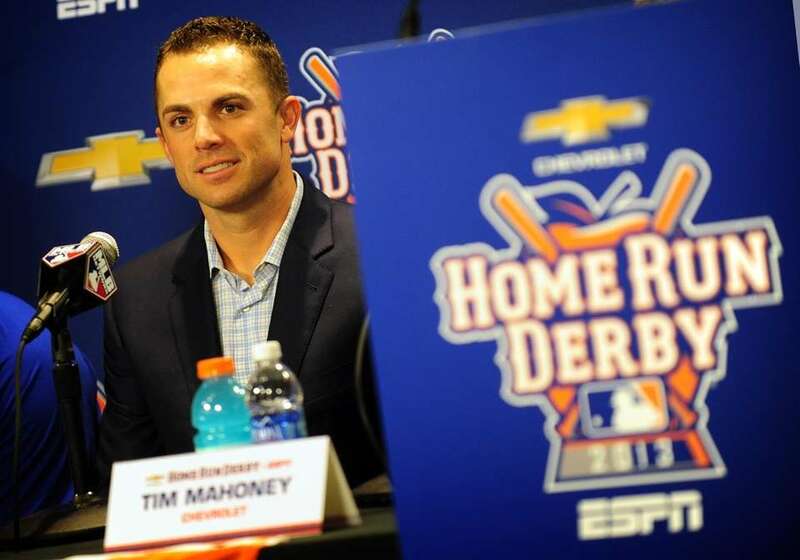 David Wright, Mets third baseman and captain of the NL Home Run Derby team, speaks during a press conference for the 2013 MLB All-Star Game at Citi Field on July 15, 2013. 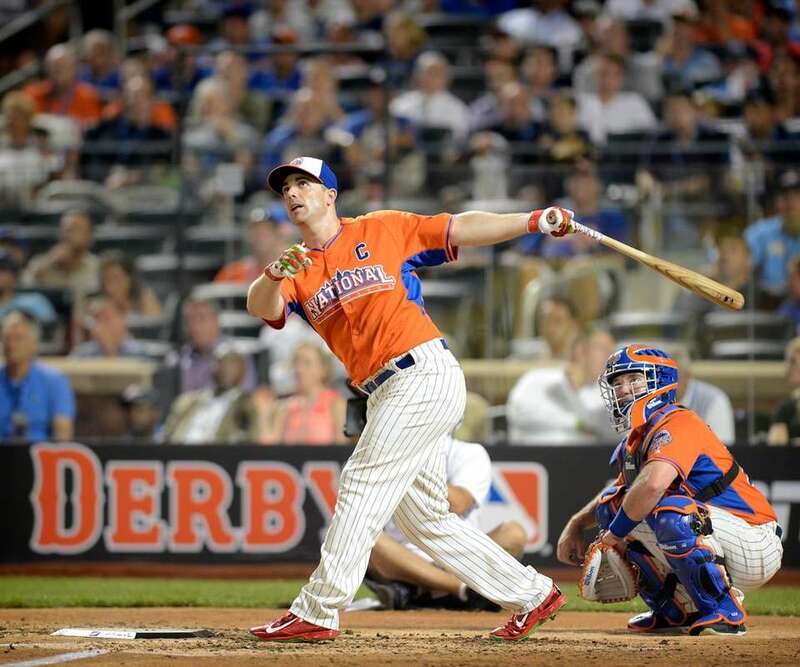 The Mets' David Wright competes for the National League in the first round of the Home Run Derby at Citi Field on July 15, 2013. 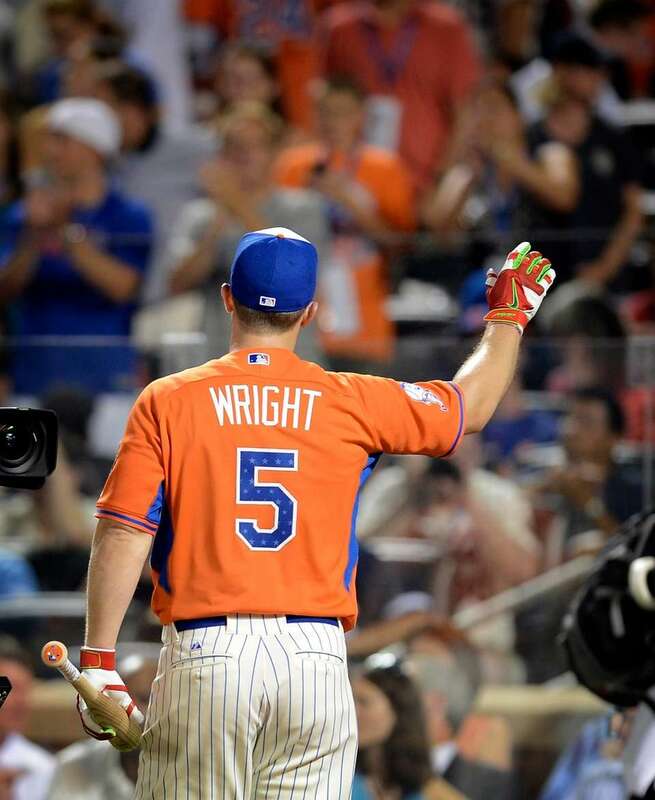 Mets third baseman David Wright competes for the National League in the first round of the 2013 Home Run Derby at Citi Field on July 15, 2013. 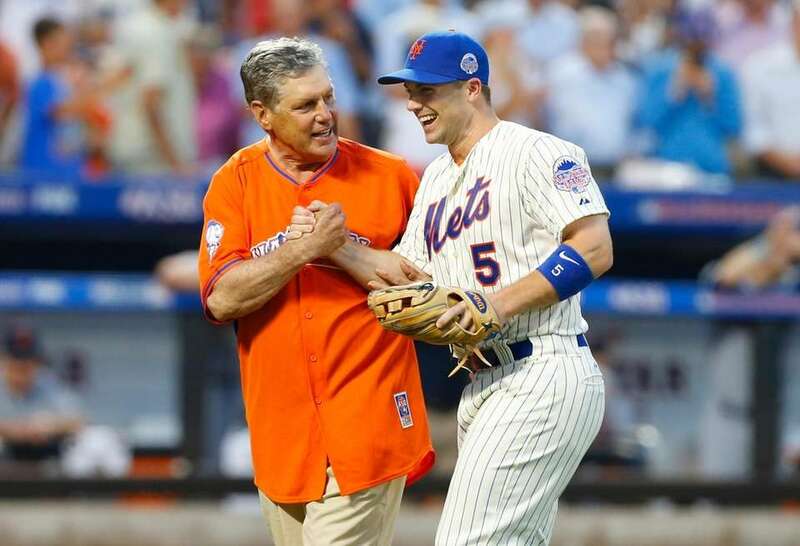 Tom Seaver and David Wright high-five after the ceremonial first pitch before the All-Star Game at Citi Field on July 16, 2013. 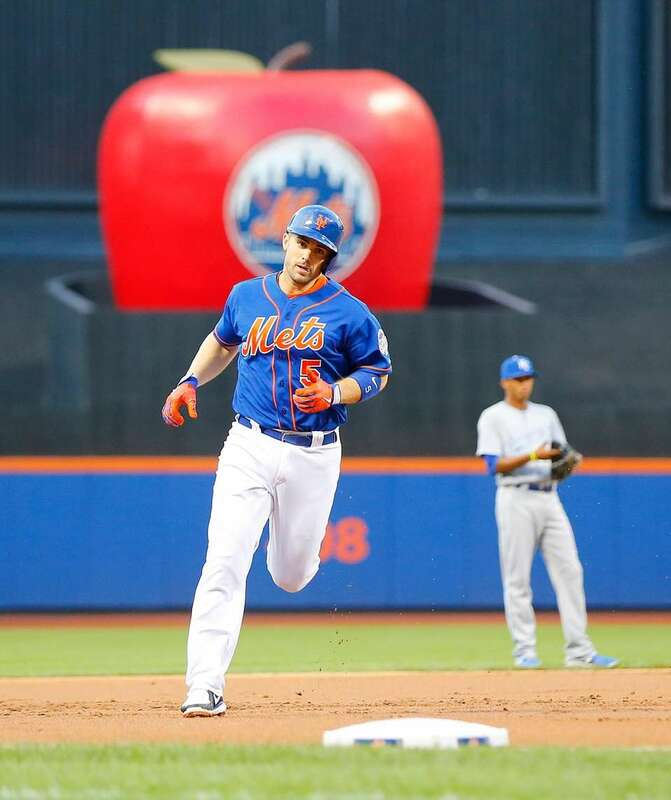 Mets third baseman David Wright rounds third base after his two-run home run in the first inning of a game against the Royals at Citi Field on Aug. 2, 2013. 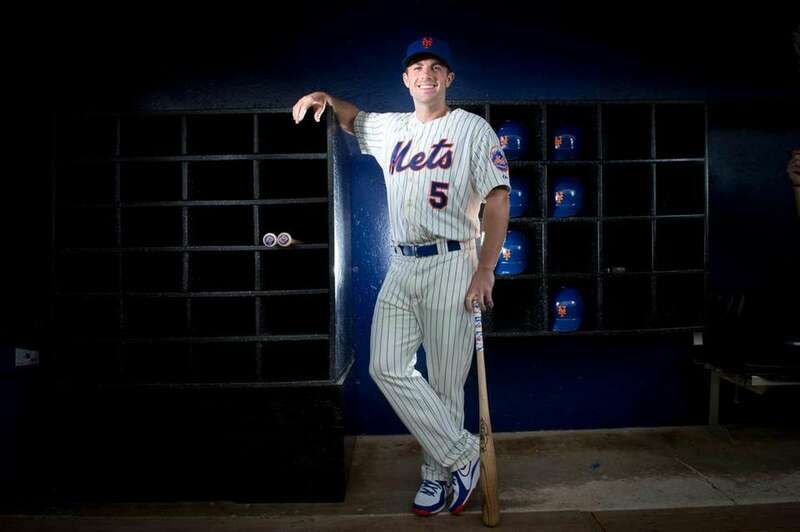 Mets third baseman David Wright poses for a photo during photo day at spring training in Port St. Lucie, Florida, on Feb. 26, 2014. 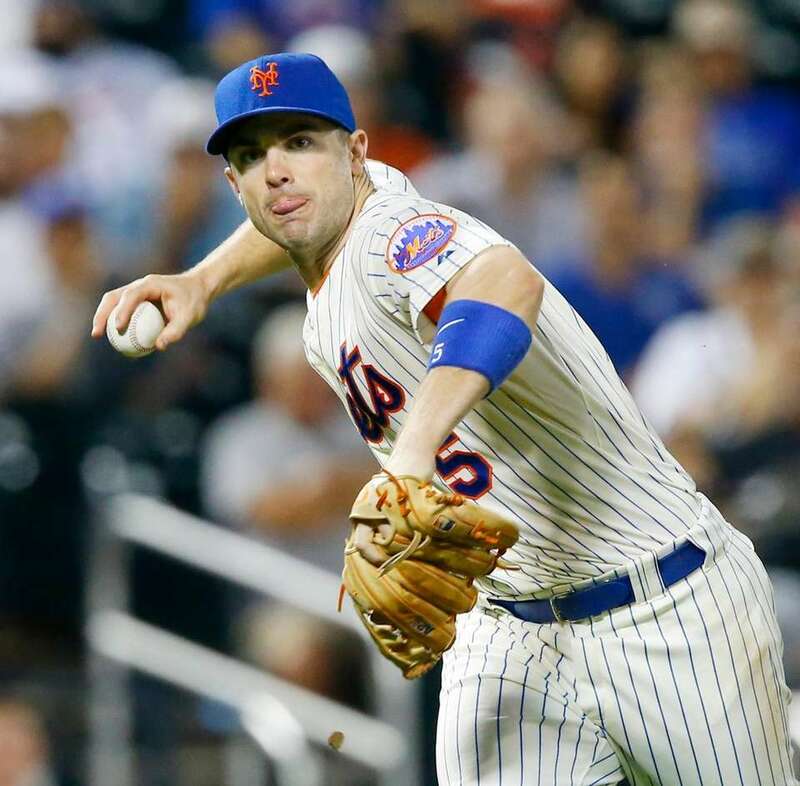 David Wright of the New York Mets fields the ball for the final out of the eighth inning against the Atlanta Braves at Citi Field on July 8, 2014. 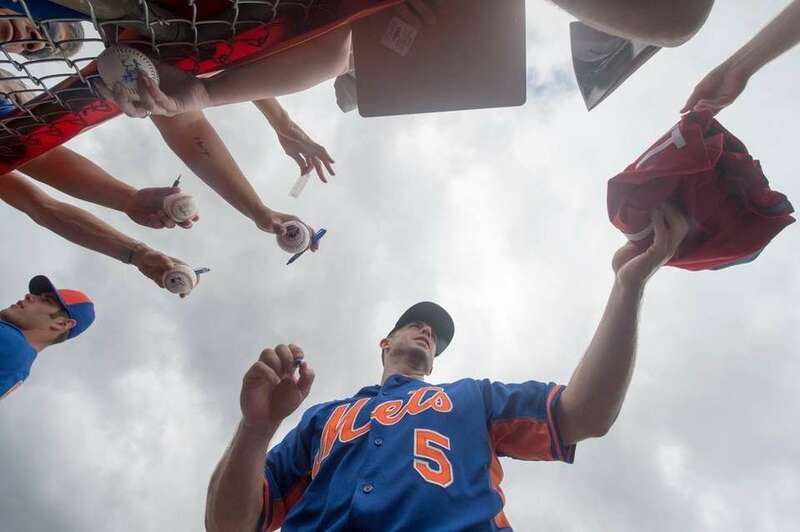 Mets third baseman David Wright signs autographs during a spring training workout on Feb. 26, 2015 in Port St. Lucie, Florida. 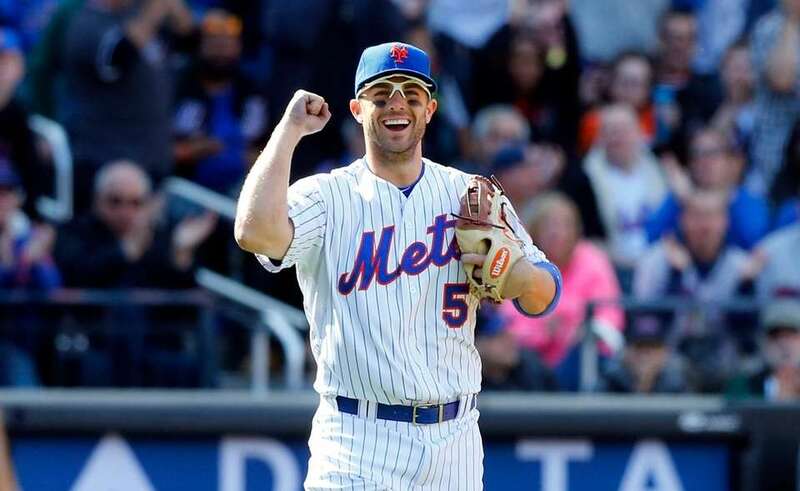 David Wright of the Mets reacts after a ninth inning double play against the Philadelphia Phillies during Opening Day at Citi Field on Monday, Apr. 13, 2015. 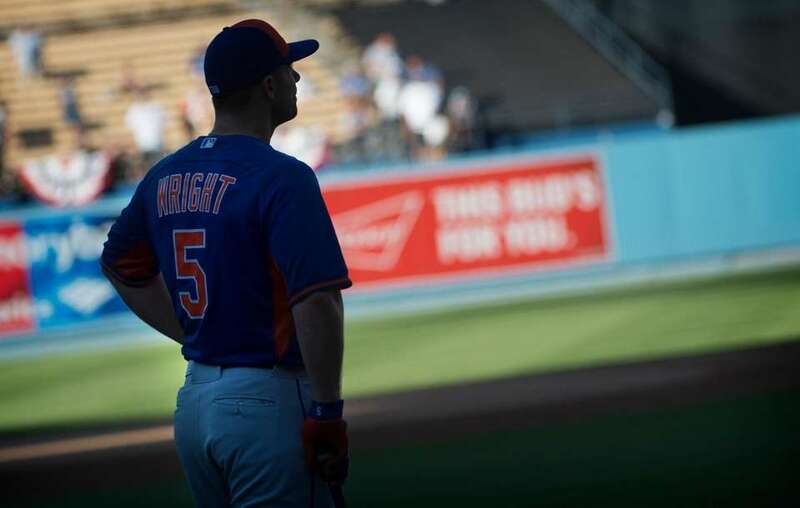 Mets third baseman David Wright looks on during batting practice at Dodger Stadium before Game 2 of the NLDS against the Dodgers on Oct. 10, 2015. 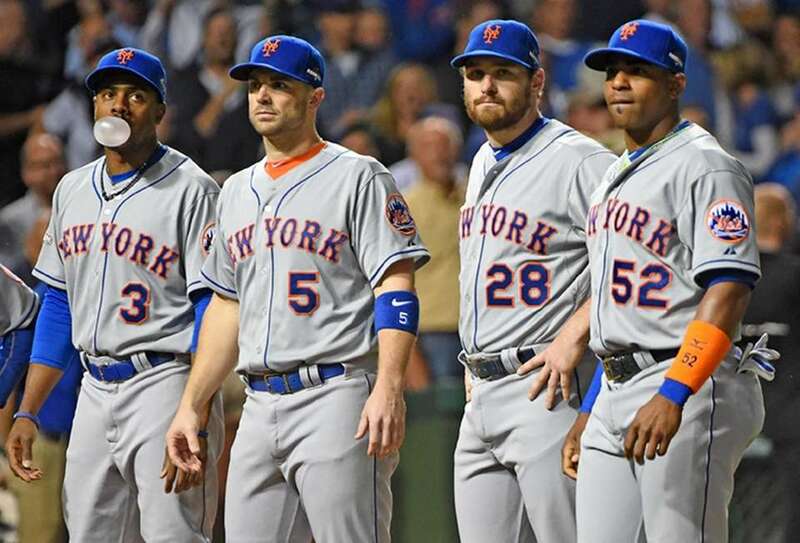 Curtis Granderson, David Wright, Daniel Murphy and Yoenis Cespedes during introductions before Game 3 of the NLCS against the Chicago Cubs at Wrigley Field on Oct. 20, 2015. 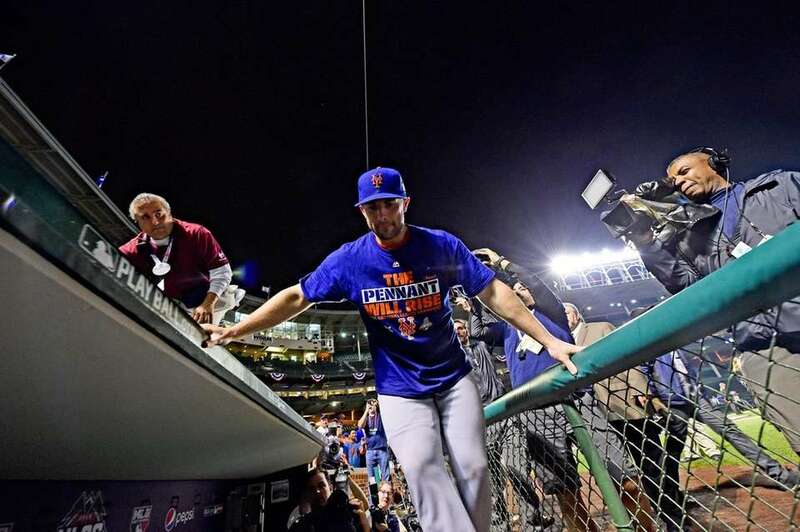 David Wright celebrates on the field after winning Game 4 of the NLCS against the Cubs at Wrigley Field on Oct. 21, 2015. 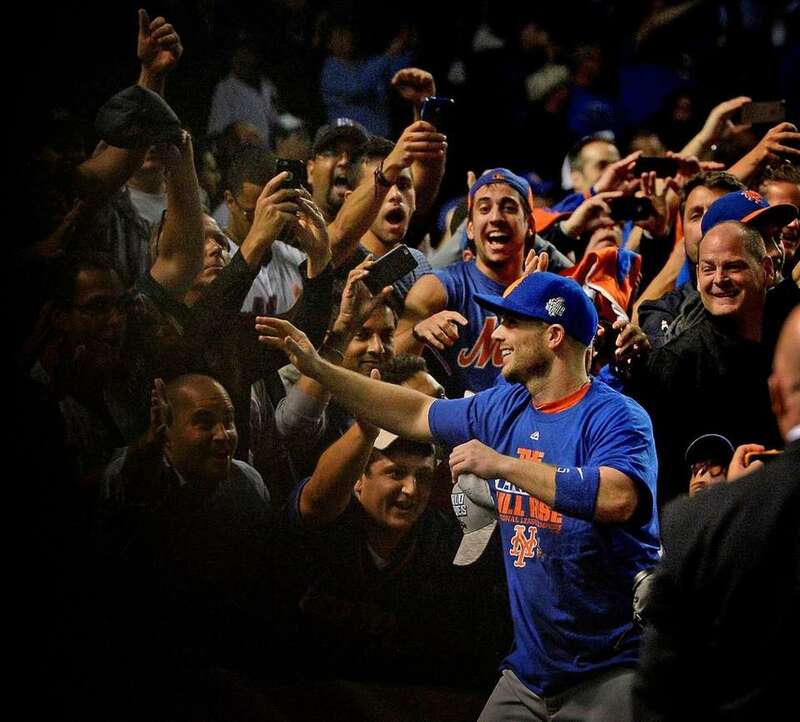 Mets captain David Wright tips his hat to the crowd as he celebrates after the Mets completed the sweep of the Cubs in the NLCS at Wrigley Field on Oct. 21, 2015. 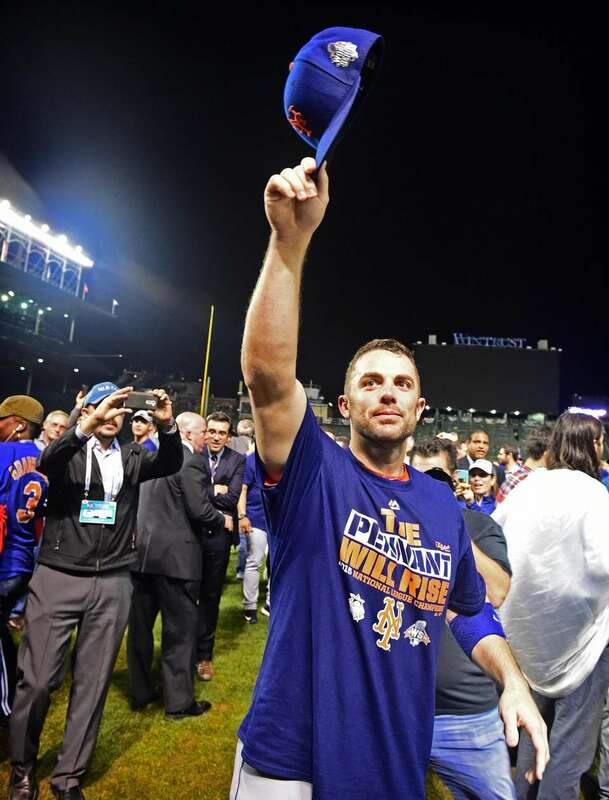 Mets third baseman David Wright celebrates the team's NLCS victory over the Cubs at Wrigley Field on Oct. 21, 2015. 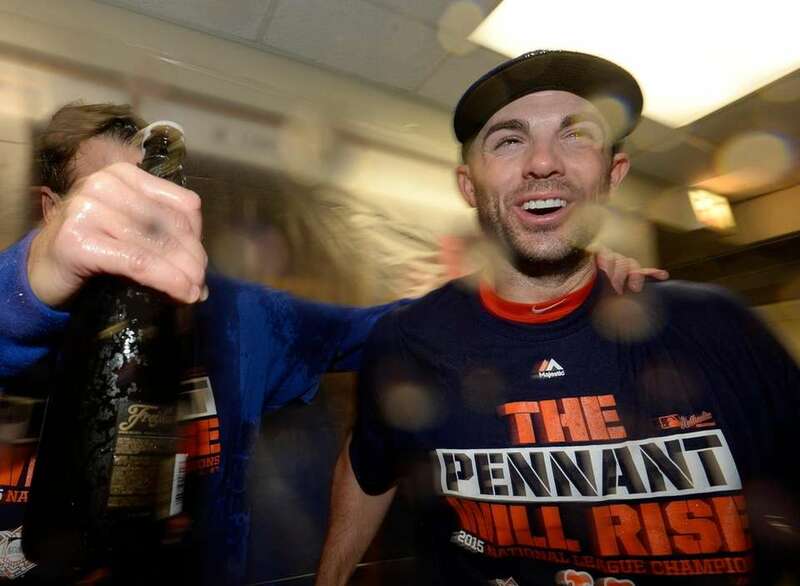 Mets third baseman David Wright celebrates with champagne in the clubhouse after the NLCS series win against the Cubs at Wrigley Field on Oct. 21, 2015. 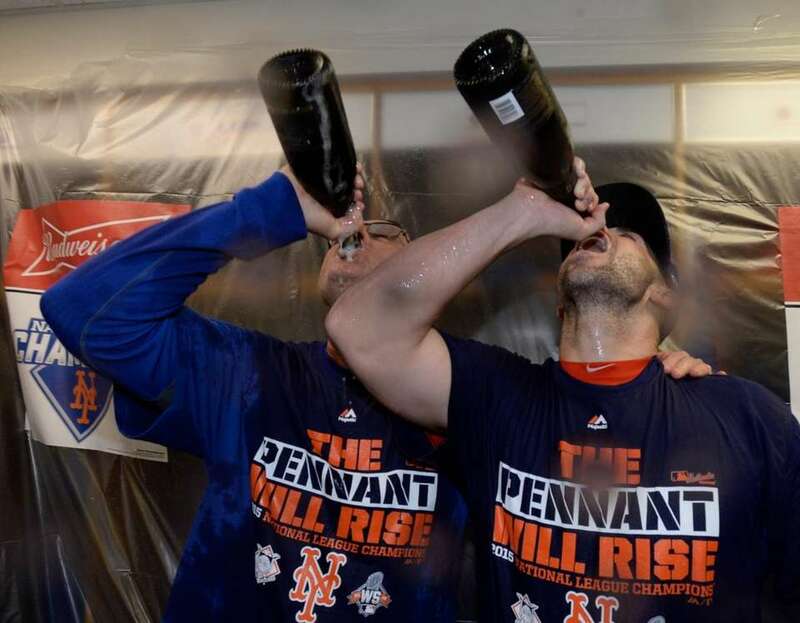 New York Mets third base coach Tim Teufel and third baseman David Wright drink as they celebrate with teammates after winning Game 4 of the NLCS against the Chicago Cubs at Wrigley Field on Oct. 21, 2015. 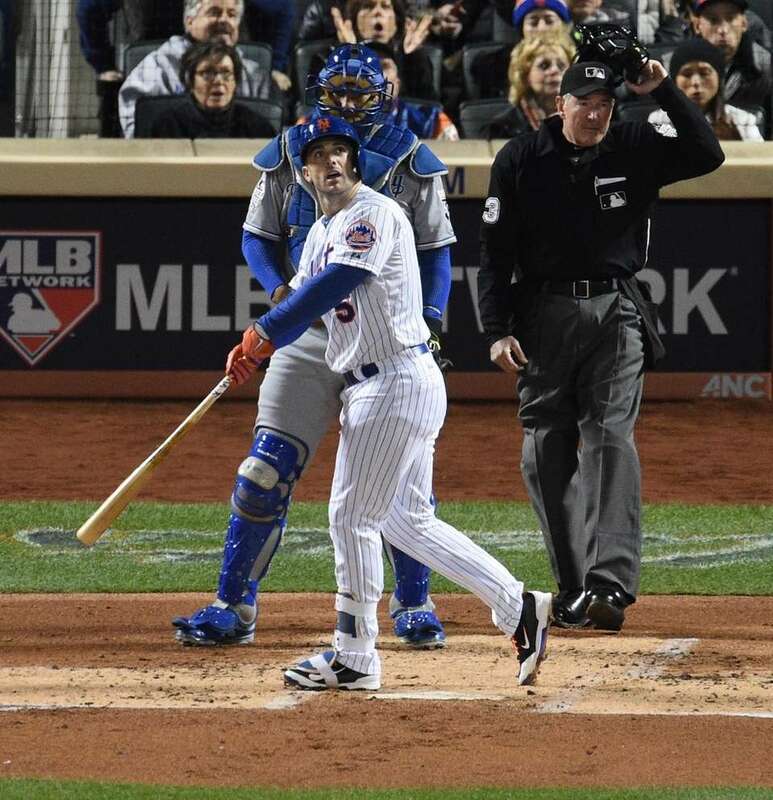 Mets third baseman David Wright hits a two-run home run in the first inning during Game 3 of the World Series against the Royals at Citi Field on Oct. 30, 2015. 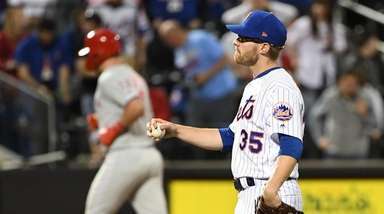 Mets third baseman David Wright fields a ground ball by Giants rightfielder Hunter Pence and throws to first base for an out during the second inning of a game at Citi Field on May 1, 2016. 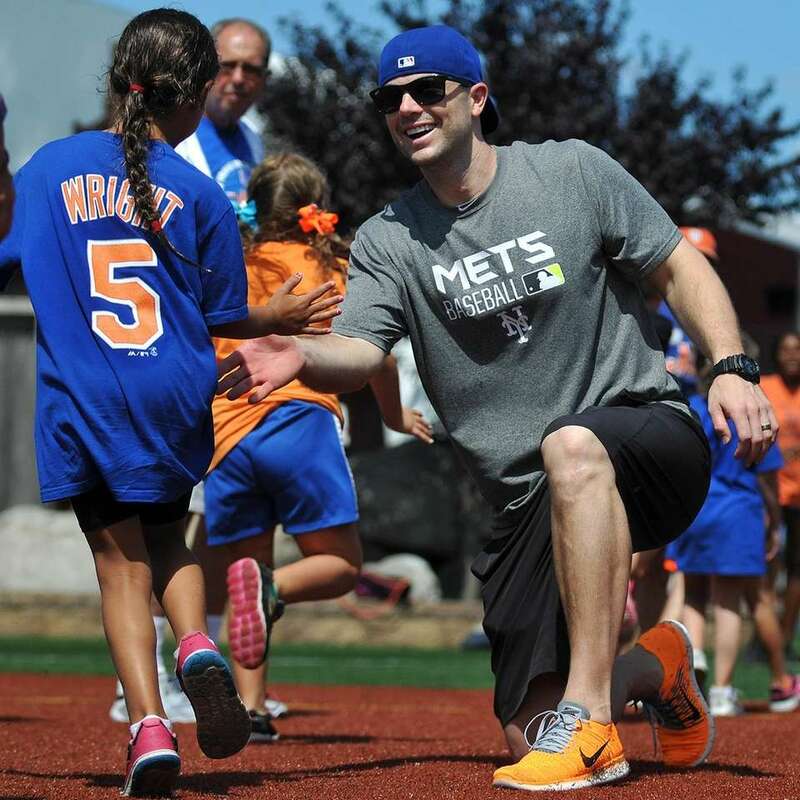 Mets captain David Wright hive-fives a fan during a visit to Coleman Country Day Camp in Merrick on Aug. 8, 2016. 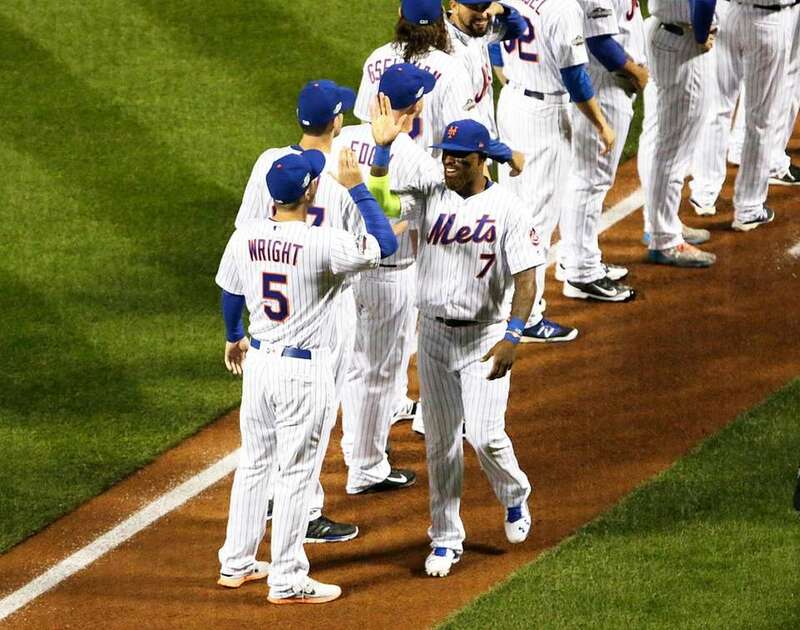 Mets third baseman David Wright gets a high-five from Jose Reyes during introductions at the National League wild-card game on Oct. 5, 2016 at Citi Field. 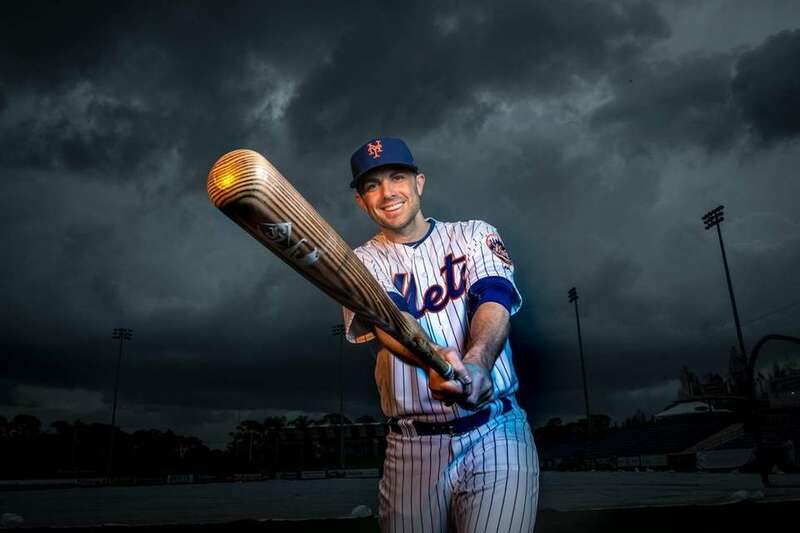 David Wright poses during Mets photo day on Feb. 22, 2017 in Port St. Lucie. 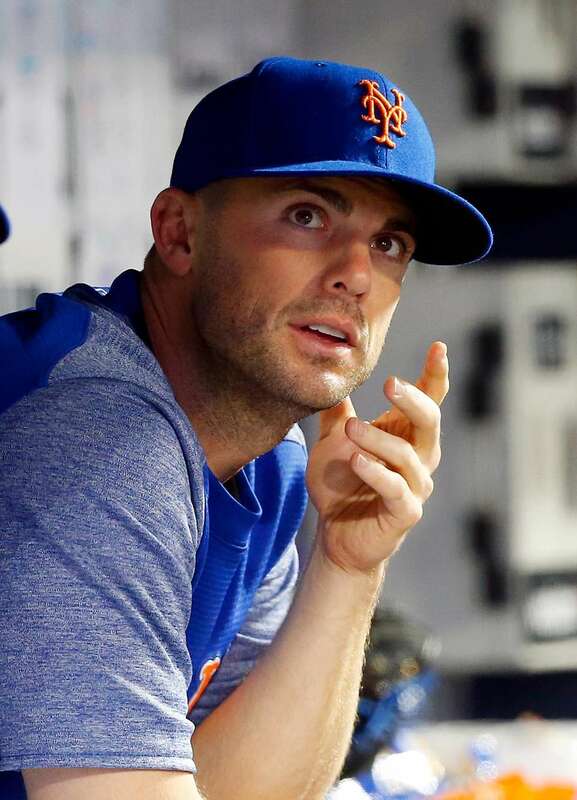 Mets third baseman David Wright looks on from the dugout in the fifth inning of a game against the Marlins at Citi Field on May 6, 2017. 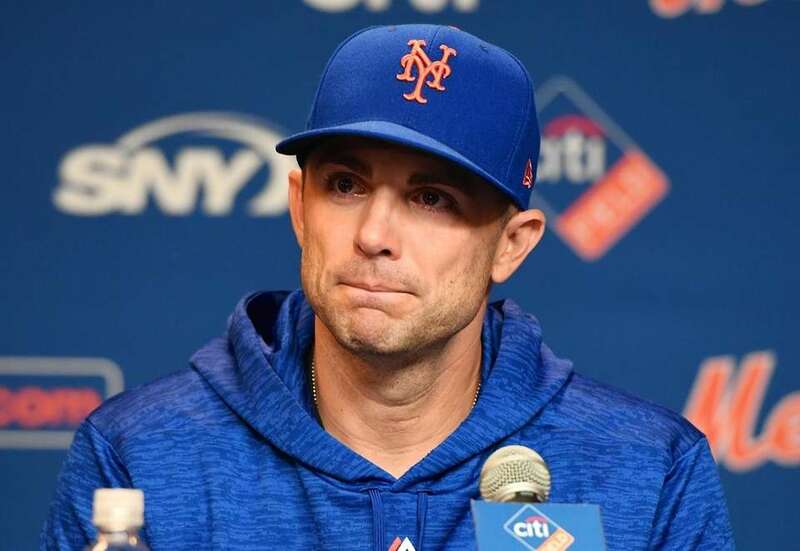 Mets captain David Wright speaks during a press conference before a doubleheader against the Marlins at Citi Field on Sept. 13, 2018.